ULAANBAATAR, MONGOLIA--(Marketwired - Oct. 7, 2014) - KHOT INFRASTRUCTURE HOLDINGS, LTD. ("KHOT" or the "Company") (CSE:KOT) is pleased to announce that its indirectly controlled subsidiary, Ashid Munkhiin Zam LLC ("AMZ"), has been awarded a contract to repair six kilometers of a 12 kilometer road repair contract awarded to four companies, including AMZ. The project is located in Khongor Sum in Darkhan Aimag, Mongolia, strategically situated on the north-south road that connects Russia, China, and all the major cities in Mongolia, including Ulaanbaatar, Sukhbaatar, Darkhan and Sainshand. The total cost of the project has been budgeted and approved by the Mongolia Ministry of Road and Transportation. KHOT anticipates completion of the project in early Q4 2014. This contract marks an important initial milestone for the Company as it commences operations in the road building and infrastructure sector. James Passin, Chairman of the Company, commented; "We are very pleased KHOT has won its initial road construction contract in Mongolia. The relatively modest size and scope of this first contract is a valuable first step as it allows the Company to gear up for the much larger opportunities in this burgeoning sector." 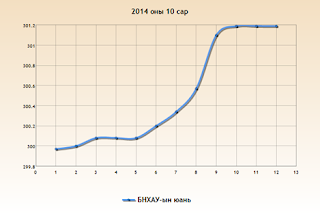 We have noted a change in the price of the Entity's securities from a close of $0.054 on 9 October 2014 to an intra day high at the time of writing of $0.065 today, 10 October 2014. We have also noted a significant increase in the volume of trading in the Entity's securities over this period. This information sheet is provided for the purpose of giving information to the public about SouthGobi Resources Ltd. (the "Company") as at the date specified. The information does not purport to be a complete summary of information about, or relevant to, the Company and/ or its securities. Ulaanbaatar, October 12 /MONTSAME/ Five stock trades were held at Mongolia's Stock Exchange on October 6-10 of 2014. In overall, 43 thousand and 879 shares were sold of 30 joint-stock companies totalling MNT 61 million 095 thousand and 048.00. "Genco tour bureau" /27 thousand and 865 units/, "E-trans logistics" /5,200 units/, "APU" /3,794 units/, "Gobi" /1,464 units/ and "Baganuur" /1,334 units/ were the most actively traded in terms of trading volume, in terms of trading value--"Talkh chikher" (MNT 16 million 414 thousand and 500), "APU" (MNT 14 million 147 thousand and 500), "Gobi" /MNT 11 million 858 thousand and 580/, "Baganuur" /MNT four million and 669 thousand/ and "Tavantolgoi" (MNT two million 573 thousand and 950). October 9 (MSE) Surveillance rule and Membership regulation of Mongolian stock exchange which approved by MSE's Board meeting on 13 August 2014 ratified by Financial Regulatory Committee on 3 October 2014 and came into force. Membership regulation of MSE regulates all membership activities such as; new membership, renew membership and terminate membership. Surveillance rule of MSE regulates surveillance related all activities in trading, membership companies and stock issuers. After FRC ratification of these two regulations, MSE successfully accomplished main regulations which must comply with Securities Markets Law. October 9 (MSE) Based on resolution No. : 201 of Financial Regulatory Committee dated on 11 June 2014, Article No. :83.1 of Company Law of Mongolia, Article. : 8.10.11 of Mongolian stock exchange's charter, Article No. :23.6, 23.9 of Listing Rule of MSE, Listing examination report regarding to official letter request No. :14/04 of "Orkhonbulag" JSC dated on 11 August 2014, Board meeting of "Orkhonbulag" JSC on 3 October 2014, respectively, "Orkhonbulag" JSC's 284,063 shares has been delisted by the decree No. : 154 of CEO of MSE in 2014. Economic growth slowed to 5.3% in the first half of 2014. It decelerated sharply from 8.7% year on year in the final quarter of 2013 to 7.5% in the first quarter of 2014 and to 3.8% in the second, as stimulus was partly withdrawn and foreign direct investment plunged by 62.4%, tamping down investment by 32.4%. Consumption increased by 10.1%, however, and exports grew by 19.1%, driven by copper and oil. Imports fell by 8.3% as mine development slowed. On the supply side, agriculture expanded by 16.3% to continue as a key driver of growth. Industry value added increased by 10.1% thanks to increased output from the Oyu Tolgoi copper mine and dynamism in construction boosted by the central bank's mortgage program. Services expanded by only 1.9% as currency depreciation and plunging investment in new mining projects took their toll. Consumer price inflation soared to 12.9% year on year in July, fueled by last year's highly expansionary fiscal and monetary policies. This prompted the central bank to raise its policy rate from 10.5% to 12.0% in August and to reduce lending to banks by 32.5% by midyear. Government revenues increased by 8.4% in the first half of 2014, while on-budget expenditure rose by 12.6%, significantly less than budgeted, to leave a deficit of 2.2% of GDP. Financing from the Development Bank of Mongolia, a major source of off-budget expenditure, dropped to 6.3% of GDP in the first half from 8.8% in 2013 as a whole. The current account deficit narrowed by 50.6% in the first half of this year, but the deficit in the balance of payments remained high. Gross international reserves had fallen by June to $1.3 billion, or cover for 3.0 months of merchandise imports, and the Mongolian togrog had depreciated by the middle of August by 14% to MNT1,892, its lowest rate ever against the US dollar. The togrog subsequently recovered by 5% in light of an agreement with the central bank of the PRC to increase the ceiling on currency swaps. The growth forecast is revised down substantially for 2014 and 2015 because of unexpectedly slow growth in the first half, persistent delays in large mining projects, and likely further policy tightening. Given the trend so far in 2014, inflation this year will be higher than forecast in ADO 2014, but restrictive policies are expected to rein in price increases in 2015 with inflation moderating but remaining above the April forecast. The current account deficit will narrow in 2014 much more than earlier forecast, then return in 2015 to the forecast narrowing trend from a high in 2012. Risks to this outlook stem from the economy's vulnerability to external shocks, in particular from commodity prices, and uncertainty regarding the authorities' success in moderating its expansionary policies. October 7 (Bank of Mongolia) On the Foreign Exchange Auction held on October 07th, 2014 the BOM has received bid offer of 32.9 million USD as closing rate of MNT 1842.95-1844.80 and 117.4 million CNY as closing rate of MNT 299.71-300.80 from local commercial banks. 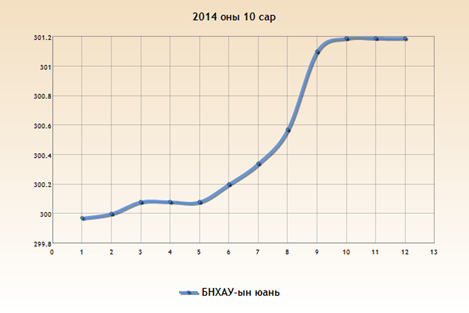 The BOM has sold 11.5 million USD as closing rate of MNT 1844.20 and 45.5 million CNY as closing rate of MNT 300.41. On October 07th, 2014, The BOM has received MNT Swap agreement offer in equivalent to 30.0 million USD from local commercial banks and accepted the offer. October 9 (Bank of Mongolia) On the Foreign Exchange Auction held on October 09th, 2014 the BOM has received bid offer of 32.8 million USD as closing rate of MNT 1844.50-1846.90 and 99.3 million CNY as closing rate of MNT 300.20-301.11 from local commercial banks. 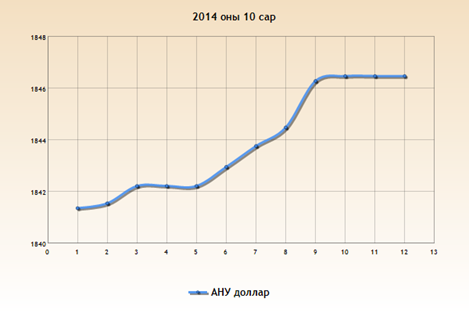 The BOM has sold 10.5 million USD as closing rate of MNT 1846.55 and 52.5 million CNY as closing rate of MNT 300.80. On October 09th, 2014, The BOM has received USD Swap agreement ask offer of 25.0 million USD and MNT Swap agreement bid offer in equivalent to 6.0 million USD from local commercial banks and accepted all offer. October 8 (MoF/BoM) Auction for 52 weeks maturity Government Treasury bill was announced at face value of 159.14 billion MNT. Face value of 159.14 billion /out of 159.45 billion bid/ Government Treasury bill was sold at discounted price and with weighted average yield of 16.0737%. Ulaanbaatar, October 9 (MONTSAME) The Minister of Finance Ch.Ulaan participated in the "30 minutes of Minister" meeting on Thursday, talking about a draft law on the 2015 state budget. The submitted to parliament draft has three features, he noted. Essential rights of exploitation of budgets are transferred to localities' authorities, the capital for salaries, pensions and allowances are increased 2.5 times or by MNT 500 billion, and this goal will be implemented in several phases without an impact on the inflation rate, and the expenses out the budgets--sources of the "Chingis" bonds, the Development Bank of Mongolia and capitals of soft-loans--will go to the state budget, the Minister said. The law creates for the public conditions to monitor the budgetary expenses in frames of the law on "glass" account. It also will not increase the tax sizes and will not create additional taxes, he highlighted. It is projected that the state budget will accumulate revenue of MNT 7.2 trillion in 2015, the expenses of 8.4 trillion will be financed. Investments for social development will be augmented, he added. "Prime Minister's 30 Minutes" Changed into "Minister's Hour"
October 9 (infomongolia.com) The Government of Mongolia has been organizing the "30 Minutes with Prime Minister" meeting on every Thursdays, so from today the meeting is changed into "Minister's Hour" and the first guest was the Minister of Finance Ch.Ulaan, who reported current socio-economic situation in the country and tasks to carry out by the Ministry. During the press meeting, Minister Ch.Ulaan noted, "Cabinet submitted the draft bill on 2015 State Budget to the State Great Khural (Parliament) and there are 3 features to highlight. First, the budget expenditure privileges are transferred to provincial and smaller-level administrations. Second, the fund to spend for salaries and pensions is increased by 2.5 times or 500 billion MNT (Tugrug). This task will not affect negatively to inflation rate due to implementation on step-by-step basis. Third, the consolidated fund from Chinggis Bond, Development Bank and soft loans is included in the draft bill. Moreover, taxes will not be increased next year in any sectors. In 2015, it expects to collect 7.2 trillion MNT in revenue, whilst 8.4 trillion MNT to spend and we submitted to amend in the bill to raise the debt ceiling, but it will not reach the 70% of GDP. Although, the construction works will be continued normally and investments into social development are increased". October 8 (Bank of Mongolia) The Bank of Mongolia has successfully hosted the SEACEN Course on Assessing Liquidity Risk of a Bank in Ulaanbaatar Mongolia during September 29 and October 3, 2014. The SEACEN Course on Assessing Liquidity Risk of a bank was designed to specifically build capacity of bank supervisors in the application of the liquidity ratios according to international sound practices and methodologies and strengthen the understanding of liquidity risk management measures taking into account changing financial market landscape. A total of 34 participants representing 15 institutions of 13 countries have been nominated to participate and 6 speakers specialized in Liquidity Risk Assessment representing Australia, United States, Thailand, Malaysia, Japan and Mongolian Regulatory Authorities and Commercial banks have shared their insights into the mentioned topic. Mr. Batshugar Enkhbayar, Deputy Governor, the Bank of Mongolia and Mr. Hookyu Rhu, Executive Director, The SEACEN Centre have attended the Opening and Closing Ceremonies as the Guests of Honors and delivered their remarks. October 9 (Mongolian Economy) Select members of the Parliament initiated and handed in a draft for the revision of the Individual's Income Taxation Law. The draft called for the MNT 84,000 income tax deduction to be expanded to MNT 232,000. With the economic situation worsening, lower to middle income households have seen a decrease in income, while the foreign exchange rate has increased. This situation has netted a decrease in purchasing capacity for households. For that reason, the draft's associated parliament members said the revision was necessary. Taxing no less than the minimum wage average, MNT 232,000, would enable citizens with minimum wage to be exempt from income taxation. According to a recent survey by the Ministry of Labour, there are over 1.1 million active workers, of which about 8.4 percent average the minimum wage. If approved, the project would benefit low income households, said draft law initiators. October 9 (Mongolian Economy) A new, automated appeals system is up and running at the Labour Exchange Central Office. According to the Office, the previous system allowed only 400 people at most to appeal in a month. Since the introduction of the new system last month, 3,800 people have appealed. With the automated system, individuals looking for work can search by job type a in any given area. The search instantly finds job offerings and information, categorised by districts. The new system has revealed the high discrepancy between the available workforce and the amount of jobs available. "So far there have been about 3,800 people actively searching for a job, yet job offerings reach about 90,000" says Ts. Enkhtuya, Director of the Labour Exchange Central Office. "Jobs such as cooks, accountants, engineers, welders, electricians, construction contractors and all kinds of subsidiary workforce are in high demand." According to recent data from the National Statistical Office, the salary amount for male workers is higher than for female workers. On this matter Ts. Enkhtuya said, "In terms of salary, it is similar for those working in government sectors. Also, there is no big difference between specialised professions." Welders, electricians and plumbers have a relatively high salary, and are mostly chosen by men. Last summer, the average wage for an electrician was MNT 70,000 a day. This is about MNT 2 million a month. Thus the salary gap between men and women differ from what kind of job they have. October 12 (UB Post) The Labor Exchange Central Office has informed that they have launched a unified database of the labor market on October 2. The new system features the ability to give social insurance payment information and show a history of work experience of individuals to employers, not only recommending job seekers. Also, they have started releasing correct figures on unemployed people, newly announced workplaces and the correct registration number of job applicants. Itzone LLC performed this database at the cost of one billion MNT of aid from the Mongolian Millennium Challenge Fund and from the invitation of the Labor Exchange Central Office. They have been surveying the unified database since August of 2013 and launched its official operation April 2014. The officials from the Labor Exchange agency appreciate this database a lot and regard this development highly. This database will bring success to everyone in the workforce. By launching this database, current troubles such as job applicant's incorrect registration numbers; overlapped home addresses and non-updated phone numbers will be eliminated. The appropriate people fixed mistakes concerning the wrong figures of registered unemployed people. This comprehensive database covers information for the Ministry of Labor, Labor Exchange Central Office, Center for Employment Services, and Occupational Safety and Disease Research Center. Also the database is connected to the fund of the General Department of Taxation and Social Insurance. Therefore the number of job applicants and insurance payers will be compared and the statistics generated. The Labor Exchange Central Office connected 142 soums and suburbs and142 khoroo of the city to the Virtual Private Network (VPN). This will lead to easy access to the network and registration to the electronic registration from anywhere. For example, over 26 types of 2500 of equipment installed and connected 9 districts of Ulaanbaatar and 21 provinces to the network. "The new system will eliminate the old mindset that it is easy to get job through the backdoor," explained the Head of the Labor Exchange Central Office Ts.Enkhtuya. She expanded her idea and added that we will be engaged with active job seekers in further and helps them to find jobs. If the job seekers register in our system once, we will recommend them jobs that suit their job skills and experience. The employers will know what kind of job experience the job applicants have by seeing their information on the network. We hope that this system will save time. Even when the employees retire, information about the person such as their job experience and social insurance payments will be kept in the network. So it is unnecessary to search archives. For the first nine months of this year, 33879 people are unemployed and actively seeking a job, out of 72500 who are registered in the network. Comparing this statistics with this time last year, the number of unemployed people who registered in the network declined by 9.9 percent or 3,718. But compared to this August, the figure has gone up by 998. Despite this, the number of registered unemployed people is declining, over 30 to 40 thousand people actively seek the work, but we don't know how many unemployed people have not registered yet besides this figure. There are many vacancy announcements throughout the media, but Mongolians still can't find jobs. What could be its reason? The deputy head of the Labor Exchange Central Office D.Battogtokh expressed his opinion on this issue. He said "One of the big pillars that represent our country's development is employment. In relation to the mining a new sector has been created and investment has increasing but unemployment is not really declining. Until now, many people are unemployed because of lack of information and resources, inconsistent education about employment and insufficiently targeted job applicants in the labor market. Our country lacks the necessary manpower, especially in the era of the mining sector. In other words, we are faced with the demand to prepare children who will be specialized in that sector. I want children to choose marketable majors. But in some cases, people are rejected because of their skillset, work interest and being unable to withstand the work load." October 10 (Mongolian Economy) This year Mongolia is projected to harvest 439,000 tonnes of wheat, 154,700 tonnes of potatoes, 100,200 tonnes of vegetables, 47,800 tonnes of rapeseed, and 41,200 tonnes of forage. This is more than enough to supply domestic demand, said the Ministry of Industry and Agriculture. Despite this impressive performance, several flour manufacturers that took loans in the scope of Price Stability Programme from the government were authorised to import 10,000 tonnes of wheat from China. For this reason, some domestic manufacturers have postponed their wheat purchases from the domestic market. This has netted a drop in selling and a huge amount of reserves in the fields. If the situation continues it would put a strain on suppliers to warehouse their wheat. This in turn may trigger a decrease in wheat production next year. Faced with such an impending mess, the Mongolia's Farmer Association called for action to protect the domestic market and to stop importing wheat. President of the Accosiation Ch. Perenlei sent an official statement for support to S. Byambatsogt, head of the Mongolian People's Party Council in Parliament. The statement said, "This year our farmers have achieved their balance goal by harvesting over 400,000 tonnes of wheat. Unfortunately, imports are to replace our harvest. If decisive action is not taken, the farmers have declared to take action against the situation. Do take this matter in consideration." To address the Association's concerns, the Mongolian People's Party Council in Parliament established a working group, including members N. Enkhbold, J. Enkhbayar, D. Khayankhyarvaa, Su. Batbold, and J. Erdenebat. Mongolia has witnessed a fall in agriculture since the 1990s. Since the 2008 implementation of the Atriin Ayan III campaign to spur the return of the domestic agriculture sector, the country has been able to supply its flour demand domestically. This year it will not only be able to meet its demands but also to export a significant surplus. Nevertheless, the Ministry of Industry and Agriculture has decided not to grant promotions per tonnes and to import cheap wheat from neighbouring countries—as in addition it has licensed five companies to import 49,000 tonnes of wheat from Russia. These companies have already brought the first 10,000 tonnes into Mongolia. Thus, the working group from the Mongolian People's Party Council in the Parliament forwarded a requisition to the Prime Minister of Mongolia. The requisition stated to stop the import of wheat and take strict actions against those who made such an irresponsible decision. October 12 (Emerging Markets) Falling commodity prices have hurt Mongolia's economy, which relies heavily on its abundant natural resources. Improving relations with China are helping it through the squeeze but the country has yet to show its true potential to global investors. Mongolia is a country on the edge economically and geographically. It was widely touted as one of Asia's biggest growth stories just a couple of years ago, but its outlook is now fragile. With falling commodity prices and foreign direct investment dwindling, the country's forex reserves have dropped to critical levels. However, the Mongolian government is expected to announce the resolution of a long running tax dispute with key investor Rio Tinto, meaning that Mongolian growth could be back on track once more. Economically, Mongolia has enormous growth potential as it sits on a rich source of minerals as yet untapped. Geographically, it is locked between China and Russia, two global powers with which it holds uneasy relationships. Despite a GDP growth rate of 10% as of July 2014, Mongolia's short term growth prospects appear weak and its macroeconomic performance continues to deteriorate, with rising inflation and slowing growth. Its failure to build adequate fiscal and external buffers against commodity price volatility is leaving its economy increasingly exposed. 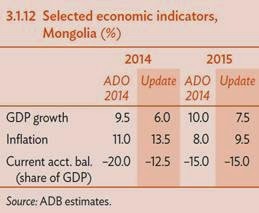 The World Bank estimates Mongolia's fiscal deficit will remain over 10% in 2014. Falling commodity prices, particularly for coal, which is Mongolia's second biggest export, are hurting growth. The nation's earnings from coal have dropped steadily from $2.27bn in 2011 to $1.2bn last year. However, with an abundance of other natural resources like copper, gold and rare earths, Mongolia's long term prospects are bright and with sectors like real estate and infrastructure growing fast from a low base, many believe consistently high levels of growth will return. "Any pick-up in demand for commodities by China, India or other emerging markets will lead to rapid growth," says Alisher Ali, managing partner at Silk Road Management. "It's clear that the long term trend is there, EMs are continuing to grow and the bear market for commodities will not last for many years." And it looks like the biggest hurdle to Mongolian growth — the long running dispute between Rio Tinto and the Mongolian government over the multi-billion dollar Oyu Tologi (OT) copper mine — could be resolved soon. In 2009, Turquoise Hill Resources and Rio Tinto signed an agreement with Mongolia's government for the construction and operation of the OT copper-gold mining complex. But after the first phase of development was completed, the progress of the mining project ran into difficulties. "The problem started in 2012 when the government cancelled their double tax treaties with a number of countries — one of these being where OT was incorporated — which was contrary to the investment agreement," says a Mongolia-based analyst. "In February 2013 the government went into open war with Rio Tinto and on July 31 Turquoise Hill made the decision to halt expansion of the underground development." Since then, he says the two sides have been working at reducing government shareholder issues but several deadlines for resolution have been missed. However, on September 22, Turquoise Hill published a statement saying that it had reached an agreement with the government to pay $30m in tax, down from the proposed $127m. While Turquoise Hill said that there were certain aspects of the ruling that required further clarification, analysts expect that the resolution will be made official imminently and that phase two of OT will resume. "Policymakers are sending strong signals that the lengthy dispute surrounding OT is over and that they are ready to move forward with Phase 2 financing," said Cousyn. "Should this indeed occur, we think it will mark the most meaningful economic inflection point for Mongolia in the last five years." The next project finance deadline is September 30 and while analysts believe it is unlikely that this will be met, they do believe that construction of phase two will resume before the end of the year. "On its own it has massive impact as it is the largest project in the country," says Ali. "But it is also a litmus test for other investors who are not committing to the country while this hasn't been resolved. A lot of investors are looking at this issue as a signal about whether the government is serious about dealing with foreign investment." The first development is expected to be a rail project which will link Mongolia's biggest coal mine, Tavan Tolgoi, to China. And after the railway, an interstate highway will be built from the Chinese border to the Russian border. This will be followed by the redevelopment of downtown Ulan Batar with all the associated potential for real estate companies, power providers and foreign investors. However, while analysts agree the project will act as a catalyst for a fairly quick recovery, the government still faces more imminent problems. Foreign direct inflows have fallen 64% year on year in the first five months of 2014, contributing to the elimination of the capital account surplus of the balance of payments. "As soon as we see the resolution of OT, that will pave the way for $6bn [investment]," says Ali. "[This could have some positive impact as reaching the OT investment agreement in October 2009] proved to be a catalyst of billions of dollars and had impact on other projects being launched. [We are hopeful that] next year things will improve." More problematic are the country's foreign reserves which have fallen to worryingly low levels. Mongolian Central Bank data shows that at the end of June 2014, gross foreign reserves had fallen to $1.3bn from $2.2bn at the end of 2013. With estimates that the country burns through $200m-$300m every month, Mongolia's finances are in a critical state and an immediate solution is needed, according to analysts. "Even if they approve Oyu Tologi by the end of the year, which would be a big positive from a sentiment standpoint, the dollars won't start to flow back in immediately," says Nick Cousyn, chief operating officer at BDSec, Mongolia's largest broker. "There's a gap that needs to be bridged between approving OT and when large expenditures are made at the project. We don't expect foreign direct investment (FDI) to recover until this happens." With the resolution of OT a distinct, if not imminent, possibility, Mongolia may be able to return to the capital markets but issuing at the sovereign level is not an option. In November 2012, the country boosted its forex reserves by issuing an international dollar bond in what bankers at the time called an "explosive" debut. The biggest Asian sovereign debut in more than a decade, it raised $1.5bn via a dual tranche 4.125% 2018 tranche and a 5.125% 2022 note, garnering a $16bn book. The proceeds took Mongolia's forex reserves to $4.1bn from $2.7bn. However, Mongolia has already reached its statutory debt limit of 40% of GDP so it will not be able to issue a bond at the sovereign level. Analysts think that the sovereign may try to tap the market via the Mongolian Development Bank. But the international capital markets remain wary of Mongolian debt, something which became clear in July when the Trade and Development Bank of Mongolia (TDBM) attempted to raise five year dollar funding. The deal took very few orders after bankers opened guidance at 11.25% on July 9. Despite books being left open for two days, the deal was pulled. Investors were simply not willing to take on Mongolian debt — the bank was issuing on behalf of the sovereign. "People are concerned about the position of the sovereign with regards to FX reserves," said a fixed income investor at the time. "If you are buying a bank in a country with potential dollar liquidity risk you are making a call as there is no way that, if the sovereign is running into problems, it will not have an impact on the bank." That Standard & Poor's had downgraded the sovereign's long term credit rating to B+ from BB- just two months earlier was also not in the bond's favour. The analyst thinks it is unlikely that Mongolia will be able to issue an international bond — this year at least. "The Chinese could very well top up, or the Japanese, but it definitely won't be on the scale of the last sovereign bond," he said. Another funding channel that Mongolia has previously tapped is the Samurai market. In December last year the Development Bank of Mongolia (DBM) issued a ¥30bn ($290m) 2023 bond at 1.52% via a private placement. 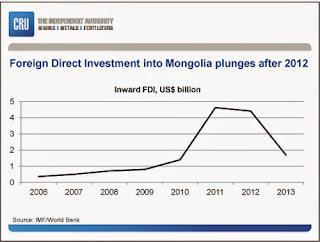 DBM has played an increasingly important role as the main financier of off-budget spending in Mongolia. Japan Bank for International Cooperation (JBIC) guaranteed the bonds and as 90% of the coupon payments are backed by the Japanese finance agency, Japanese investors viewed the paper as a JBIC credit. "With the Samurai bond issue and recent agreed swap line extension with China, the funding gap for the Mongolian government might not be critical," says Ali. "Perhaps an additional $500m would be sufficient before commodity prices like coking coal may strengthen and OT is resolved." However, BDSec's Cousyn does not believe another Samurai is possible, at least for this year. "Mongolia is already at, or slightly above its statutory debt limit of 40% of GDP," he says. "Parliament is unlikely to raise that limit." In June 2014, the World Bank estimated that the remaining available funds for off-budget spending from these two bonds are around $1bn. Most of the available reserves are expected to be used this year to finance public projects and economic stimulus programmes. "Under these assumptions, the overall fiscal deficit including the DBM spending is expected to reach over 10% of GDP," the June 2014 report says. Without access to funding via the capital markets, Mongolia may need to rely on a bail-out from an external party. Experts believe that this will come from China and not the International Monetary Fund. Relations with China have improved recently, with the Mongolian government welcoming President Xi Jinping on a state visit on August 21-22. Most importantly for Mongolia's funding needs, on August 21 the Bank of Mongolia (BoM) and the People's Bank of China (PBoC) increased their currency swap agreement to Rmb15bn ($2.4bn) from Rmb10bn, effective for the next three years. "If OT Phase 2 doesn't go forward, Mongolia may need a bail-out package which most likely would come from its neighbours. It's a trend we're seeing globally, economic crises are being resolved regionally as the world doesn't want the IMF in their business," says a banker. "The country can't handle the austerity associated with an IMF bail-out." October 8 (infomongolia.com) At the Plenary Session of the State Great Khural (Parliament) held on October 07, 2014, the final discussion on amendments to the Law on Government to restructure the Cabinet submitted by Prime Minister N.Altankhuyag was revised and approved with 73.9 % of votes. Some 51 members out of 68 parliamentarians attended have agreed to diminish the Government Ministries from current 16 to 13 with 11 Regulatory Agencies and 19 Implementing Agencies, whereas 6 Ministries will be merged into 3 Ministries and in addition, the Ministry of Foreign Affairs will be renamed as the Ministry of Foreign Affairs and Economic Cooperation. Moreover, the newly amended law will enter into force as soon as Cabinet members or newly promoted Ministers will be approved by the Parliament. October 9 (infomongolia.com) On October 08, 2014, President of Mongolia Ts.Elbegdorj received in his office the Heads of major Political Groups at the State Great Khural (Parliament) to discuss about newly amended the Law on Government. These political groups were represented by Head of the Democratic Party at the Parliament D.Erdenebat, Head of Mongolian People's Party at the Parliament S.Byambatsogt and the Head of "Justice" Coalition (MPRP - MNDP) in the Parliament N.Battsereg. During the meeting President Ts.Elbegdorj emphasized when to promote new Minister of Cabinet, Heads of Groups should consider not to appoint a member of Parliament and said, "From now on, we should stop of holding two posts simultaneously as Parliamentarian and Minister. However, it is accredited by the law, but a parliamentarian should not to chair a Ministry office and only Prime Minister can be a Member of Parliament. Therefore, please re-consider this issue at the group meetings". Ulaanbaatar, October 7 (MONTSAME) At its regular meeting on Monday, the parliamentary faction of the Democratic Party (DP) received a report from the Prime Minister on implementation of the 100-day programme on intensifying the national economy. They concluded that this programme has been realized well and highlighted some achievements gained in forwarding the economy, completing great construction actions, and in stabilizing currency rates by forming the currency reserves. After this, the faction underlined that they back the changes in the government structure and composition, "it is healthy action", the faction head D.Erdenebat noted. Regarding the so-called "Double-coat" matter (simultaneously occupying posts of MP and member of government) he said it would be regulated by laws. October 10 (infomongolia.com) The Head of Mongolian People's Revolutionary Party (MPRP) Nambar ENKHBAYAR, who is under treatment in South Korea has arrived in Ulaanbaatar last night on October 09, 2014. At the Chinggis Khaan International Airport, former President N.Enkhbayar was welcomed by his fellowmen including Deputy Prime Minister D.Terbishdagva, MPRP Secretary General G.Shiilegdamba, Minister of Health MP N.Udval, MP O.Baasankhuu, MP N.Battsereg, MP Yo.Otgonbayar, Finance Minister MP Ch.Ulaan and his son E.Batshugar as well as he was crowd by many reporters and suporters. Before leaving the airport, N.Enkhbayar gave a brief interview to journalists regarding the latest rumors that he had asked for Korean citizenship. It was reported that you asked for political asylum in South Korea. Is it true? I will never do such decadent decision. This is disinformation and even never thought about it. I missed my home country. Is your treatment finished now? Not yet, I asked a short break, because my old-age parents asked me to come back. Honestly, they do not feel well and after visiting them I intend to go back for the treatment. Your sudden visit caught attention of many that coincides with Government restructure issue being discussed nowadays. Is it somehow connected with this issue? Probably my Party members would ask my opinion. October 9 (infomongolia.com) On October 08, 2014, the Citizenship and Migration General Authority of Mongolia (Immigration Office) deported 130 foreign nationals on the ground of breaching the relevant regulations and rules. In 2014, the Immigration Office deported a total of 1,275 foreign citizens from the territory of Mongolia, whose visa and residence permit cards were expired, who were conducting activities differ from purposes and who were employed without authorized permissions. Ulaanbaatar, October 8 (MONTSAME) A draft resolution on issuing benefits for the very first leaders of the 1990 Democratic revolution was presented to the Speaker Z.Enkhbold by Kh.Battulga, D.Ganbat, L.Erdenechimeg and M.Zorigt MPs on Wednesday. The State has been pursuing policies on paying benefits and glorifying the veterans and figures who fought and contributed in the national revolution of 1911, the People's revolution of 1921, the Khalkh river battles of 1939, and the Liberation war of 1945, noted Battulga," now the time has come to improve the life of those who formed the Mongolian Democratic Union, were in the vanguard of the Democratic revolution and saw its results in 1990, the Year of a white horse". The history of the Mongolian Democratic Union is the history of the country's democracy. Its 25th anniversary is happening this year, "so it is vital to resolve the social problems of these figures", he said, adding that the draft resolution has been formed on the basis of the Constitution of Mongolia and the law on Parliament. October 8 -- In the latest effort by the Government of Mongolia (GoM) to increase foreign investment and accelerate economic activity, the Great Khural, or Parliament, has adopted the Law of Mongolia on Petroleum. The law is already in effect. The new Petroleum Law is the first overall revision in this area since 1991. Although the ultimate success of the Petroleum Law will depend on the terms of the licenses and production sharing contracts (PSC) that are approved by the GoM, its enactment is providing additional assurance to investors that Mongolia is eager to maintain and improve its position in the global economy. The Petroleum Law regulates all aspects of petroleum prospecting, exploration and exploitation within the territory of Mongolia. Natural bitumen, oil shale, tar sand, gas-rich shale, gas sand and coal bed methane are all covered, in addition to conventional crude oil and natural gas. Although the state will have ownership over petroleum, it will exercise this ownership by issuing licenses and by entering into a PSC with contractors. To learn more about how you may benefit from Mongolia's new Petroleum Law, please contact Stewart K. Diana. *Battushig Batsuren, a 2014 graduate of Chicago-Kent College of Law, is scheduled to be sworn in as a member of the Illinois Bar in November 2014. Oct. 7 (Bloomberg) -- Mongolia has granted a construction license to build the 50-megawatt Tsetsii wind farm, according to Bolor Artan, CEO at Newcom LLC, one of the partners in the company developing the facility. October 9 -- Macmahon Holdings Ltd (ASX:MAH) is pleased to advise that the standstill agreement currently in place with Erdenes Tavan Tolgoi, and described in the Company's ASX announcement on 18 September 2014, has now been extended for a further two weeks. The standstill will now end on 23 October 2014 unless extended further. The extension allows the parties further time to negotiate the matters between them and progress alternative solutions. The standstill agreement protects the positions of both parties while the negotiations continue. October 10 (infomongolia.com) During the visit of President of the Russian Federation V.V.Putin to Mongolia conducted in September 2014, one of the issues agreed was to develop cooperation under concessional terms to supply Mongolia's agricultural products, including meat and meat products on Russian market. In accordance with principle agreement negotiated to carry out, Mongolian delegates led by Minister of Industry and Agriculture Sh.Tuvdendorj have paid a working visit to Moscow on October 07-08, 2014. The visit was aimed to realize the tasks on exporting agricultural products from Mongolia on zero tariff condition and regardless of volume for some 20 years. In the frames of working visit, Mongolian delegates held a meeting with Minister of Agriculture of the Russian Federation Nikolay Vasilyevich Fyodorov and Head of Federal Service for Veterinary and Phytosanitary Surveillance Sergey Alexeevich Dankvert, where the two sides have reached consensus to increase in supplies of animal products of all types from Mongolia to Russia by removing existing tariff and lighten meat quarantine condition barriers. After which, parties agreed to set up a joint working group to study this possibilities and Russian side expressed its readiness to send inspection teams to Mongolia and if meat products' health and safety assurances meet criteria, Russia is ready to allocate meat import licensing and quotas as much as Mongolia can export. Moreover, during the talks it was mentioned that Russian Trade Agency in Ulaanbaatar will be soon opened to contribute to the bilateral trade development, where a permanent representative responsible for veterinary quarantine issue will be appointed as well as Russia pledged to assist Mongolia in providing the required amounts of vaccine to fight foot-and-mouth disease if so decided. Ulaanbaatar, October 9 (MONTSAME) The construction of the new airport has been planned to achieve 26.8 percent by the end of this year, now it has exceeded by 1.7 percent, the Minister of Road and Transportation A.Gansukh was told October 8. Together with authority of the General Authority for Civil Aviation he visited the airport construction site in Khushig valley in Tov aimag. In frames of the project, over 30 facilities are to be erected. This year, a construction is being run of the main facilities such as a terminal capable of receiving three million passengers per year, a runway to receive 22 thousand airliners to depart and arrive, an air traffic control tower, Fire fighting and Rescue departments buildings, electric fundamental and assistant stations, independent water supply facilities, heating facility, and 1,490 meters long engineering circuit tunnel. The executor organizations have completed earthworks in over five million cube meters of space for the dam and the building grounds, which equal to 90 percent of the total work. Only the runway cementation on 162 thousand square meters have been completed, and are underway a 70-percent of casting the concrete, covering of 65.9 thousand cube meters of the runway, and 39.3-percent of steel reinforcing of the main terminal building. October 7 (infomongolia.com) The Mongolia-Australia Development Forum themed "Mining, Sustainable Development and Partnerships" is scheduled to take place in the May Hancock Auditorium of the University of Queensland, St Lucia in Brisbane, Australia on October 31, 2014. At the Forum is focused on enhancing Mongolia-Australia relations and cooperation as well as managing the impacts and benefits of mining for sustainable growth. Moreover, during the Symposium topics will be discussed on Mongolia`s development challenges, Mongolia-Australia relations and cooperation, Resource governance and policy issues, Environmental, social and gender issues, Managing regional and local impacts and benefits, and Knowledge transfer and Australia`s contribution. At the Forum, Ambassador Extraordinary and Plenipotentiary from Mongolia to the Commonwealth of Australia Mr. Ravdan BOLD, Deputy Director of the Sustainable Minerals Institute Prof. David Brereton, Director of Centre Social Responsibility in Mining Prof. David Mulligan as well as many other speakers, panelists and moderators will deliver opening and keynote speeches. Ulaanbaatar, October 11 (The Economist) NOT long ago Mongolia seemed a blessed land, with growth rates—over 17% in 2011 and around 12% in each of 2012 and 2013—that were the envy of the world. Mining was the promise in a country with annual GDP per person of less than $2,000 just five years ago and $4,000 today. Some $3 trillion of get-at-able minerals are thought to lie under a country bigger than France, Germany and Spain combined, equivalent roughly to $1m for each of nearly 3m Mongolians. For many, the despoiling of a pristine landscape and a capital, Ulaanbaatar, with the second-worst air pollution in the world, seemed a price worth paying for a boom that made politicians rich and filled the streets with snazzy new cars and apartment towers. But now the shine has come off. Mongolia faces a balance-of-payments crisis in which its hard-currency reserves have fallen by two-thirds; the currency, the togrog, is also sharply lower. At home, a credit crunch has brought Ulaanbaatar's building frenzy to a near-halt. One factor is coal, Mongolia's chief mineral export before a vast new copper mine, Oyu Tolgoi (OT) in the Gobi desert, comes properly on-stream. Its price has fallen as demand from China has slumped. The second factor is a fight among the foreign investors who fuelled the boom; and for that, the Democratic Party government is squarely to blame. The importance to Mongolia of OT, controlled by Rio Tinto, a British-Australian giant, is hard to overstate. When it is fully up and running, sending ore across the border to China, it could account for one-third of GDP. 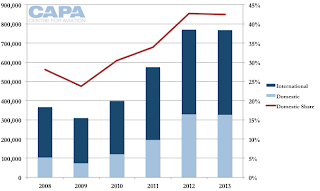 The $6 billion spent to date accounts for most of the recent foreign direct investment. Yet the project is stuck in bitter disputes between Rio and a meddling Mongolian government, which owns 34% of the project, over the scale of management fees, the kinds of cost overruns that are inevitable when developing such a large mine, and demands for tax. Mongolia's raucous democracy has amplified the disputes. Until they are resolved, Rio refuses to start spending the $5 billion or so needed for the second, and harder, phase of OT's development, when the mine will start to dig deep. Mongolia's finance minister, Ch. Ulaan, admits that it would have been better had the government not insisted on being a shareholder in OT but had merely pocketed the royalties. Too late. Other foreign miners have taken fright, further alarmed by the suspension of over 100 other licences pending a government review over corruption. Foreign direct investment has fallen by three-fifths this year. Thankfully, signs suggest the government and Rio are narrowing their differences. Rio says it has finished a feasibility study of the second phase at OT. The government seems to have backed down over huge tax demands. That is welcome, but meanwhile the government also faces the consequences of ill-advised domestic measures implemented last year to counter a slump in growth. One was a "price-stabilisation programme" designed to reverse a fast rise in the prices of basic foodstuffs and construction materials. Another was to subsidise mortgages, bringing down the rates Mongolians paid from roughly 18% to 8%. Both measures involved huge central-bank injections of money into the banking system and the alarming growth of the government's off-budget financing. The session of the State Khural (parliament) that opened this month is supposed to consider emergency measures to rein back spending, but cutting the mortgage subsidy, in particular, will prove politically tricky. Meanwhile, the level of non-performing loans at banks, currently under 5%, is certain to rise. Even without progress on OT's second phase, Mongolia should be able to avert a full-blown crisis, thanks largely to offers of help from its southern neighbour, China. Hard-currency reserves inched up in August, due in part to a loan from China's development bank. Moreover, China has offered a lifeline in terms of extensive swap arrangements to Mongolia's central bank. President Xi Jinping of China recently called on his Mongolian counterpart, Tsakhiagiin Elbegdorj. So too did Vladimir Putin of Russia, which was Mongolia's overlord until a democratic revolution in 1990—led by a young Mr Elbegdorj. What Russia can now offer is unclear; one analyst in Ulaanbaatar says that Mr Putin's chief motive was to "bare his arse to the West". Mongolia has long been a staunch friend of the West as it has tried to keep from falling into either Russia's or, expecially, China's orbit. Now, both want their pound of flesh. There is talk of Sino-Russian gas pipelines and railways crossing Mongolia. China's state mining companies, which Mongolia has long sought to keep out, may muscle in. And that may be only the beginning of the Chinese influence. The price of the Democrats screwing up has been the loss of some of Mongolia's treasured autonomy. Carbon financing helps Mongolia preserve its grassland resources and reduce greenhouse gas emissions from the country's livestock population. October 6 (ADB) Talk of greenhouse gas emissions and global warming in an Asian context and it tends to conjure up visions of toxic vehicle fumes choking the region's many megacities or belching chimneys of polluting factories. Yet in Mongolia, animal husbandry contributes significantly to the greenhouse effect. The biggest contributors of greenhouse gas (GHG) emissions in the country are still energy, mining, and vehicles, with carbon dioxide making up about 50% of the emissions. But methane is a close second at 40%. Moreover, most of the country's methane (85%) is generated by animals' digestive tracts and discharged by the animals as they pass wind or belch, while the rest is emitted from animal manure. "Methane is 23 times more potent than carbon dioxide as a greenhouse gas," says Carey Yeager, an ADB Climate Change Specialist. "In the case of Mongolia, methane emissions from livestock account for more than 90% of agricultural emissions and about a third of the country's total emissions that contribute to climate change." On a global scale, Mongolia's total greenhouse gas emissions are low. But on a per person basis, the country's emissions are relatively high because of the long, cold winter requiring a lot of heating, and low energy efficiency of older technologies. The carbon dioxide from emissions is stored in plants and soils. The oceans -- with their microscope plants in the water -- also store carbon. As forest, wetlands, and grasslands are felled or degraded, large amounts of this stored carbon are released into the atmosphere. Melting permafrost, including in northern Mongolia, also releases methane. "Mongolia needs to focus on countering the actions that cause climate change, by reducing greenhouse gas emissions through improved grassland management, sustainable livestock practices, fuel-efficient technologies and protecting natural resources, so that stored GHGs are not released into the atmosphere," adds Yeager. The grasslands on Mongolia's steppes evolved over millions of years with large herds of grazing wildlife, with herds migrating regularly and herd size regulated through predation, disease, and food availability. As herders domesticated livestock, and boosted their numbers in the hopes of increasing their incomes, pasture has become degraded and yields have decreased. This leads to decreased livestock productivity and decreased incomes. Grazing is a natural function of grassland ecosystems, but must be managed well for grasslands to be sustainable and support herders' livelihoods. When pasture becomes degraded, bare ground increases and becomes hardpack - much of the rainwater runs off with little absorbed into the soil and topsoil is lost through erosion. This process leads to desertification. Invasive species and species low in nutrients better suited to poor environmental conditions replace nutritious plants palatable to livestock. It takes several hundred years for 2 centimeters of topsoil to form, but through mismanagement of the land, these 2 cm of soil can be destroyed in 10 years or less. Some 70% of Mongolia's land is degraded through overgrazing, deforestation, and climate change. More than 80% of the country's territory is defined as highly vulnerable to climate extremes. The answer is to improve soil quality through best practices (such as natural regeneration and re-seeding with nitrogen fixers), maintain good-quality pasture and vegetation through rotation plans and avoidance of over-grazing, and improve livestock productivity through breeding, animal health care, and fodder production. When pasture is used without rotation, it degrades and productivity declines. As a result, less carbon is stored in plants and soils. In pastures under high stress, biomass can decrease by 30-40% in a few years. To ensure sustainability, herders neighboring one another should cooperate in establishing a rotating and resting scheme for their pastureland. Herders must also create favorable conditions for the soil to absorb and retain moisture such as re-establishing vegetation cover. Access to water for livestock is another constraint. Simple measures to increase access include piping water from rivers and springs or building small reservoirs and water tanks. Snowmelt and rainwater can be collected through building small stone dams along slopes to slow down the runoff of water. ADB has been supporting regional cooperation among the countries of northeast Asia to combat dust and sandstorms resulting from desertification. It has also provided technical assistance to the People's Republic of China and Mongolia to access carbon financing to sustainably manage their grasslands. A new report produced by ADB in cooperation with the Mongolian Government aims to raise awareness of climate change impacts on people, livestock, and grassland ecosystems and provide potential responses. "The threats posed by climate change have significant impacts on Mongolia's grassland ecosystems and herders' livelihoods," ADB Director General for East Asia Ayumi Konishi writes in the foreword. "This knowledge product identifies sustainable management practices that will increase communities' resilience to climate change, improve environmental quality, and increase local revenue." October 6 (CRU Group) It is five years since John Johnson, CRU's China Country Manager, first visited Mongolia and he has closely followed the many twists and turns in prospects for Mongolian mining since that first visit. As a result of a recent visit to Ulaanbaatar during September 2014, and discussions with key players there, in this article he suggests there is good reason to feel more optimistic about the country's mining prospects, although there still remain some challenges to overcome. The minerals that are most relevant to Mongolia include coal, copper, iron ore, gold, molybdenum, zinc, tin, titanium, tungsten, rare earths, uranium, limestone and fluorspar. Currently, minerals are estimated to account for 22% of Mongolia's GDP, 61% of its value-added and 94% of Mongolia's exports, of which 88% are exported to China. Mongolia also has ambitions to add value to some of these minerals, including the Sainshand industrial complex, with plans to include downstream steel, coke and copper as anchor industries. · 2006: Windfall tax on gold and copper. · 2007, 2013: Announcement that the government would compulsorily purchase stakes in strategic deposits. · 2010: Cancellation of mining licenses and a presidential moratorium on new exploration licenses. · 2011: Renegotiation of government agreements that had been previously agreed, including the 2009 Oyu Tolgoi Investment Agreement and the reversal of the government's choice of strategic for investors in Tavan Tolgoi. · 2012: The Strategic Entities Foreign Investment Law (SEFIL) restricting foreign investment, which came about as result of the attempted acquisition by Chalco of China of South Gobi Coal. · 2013: Unilateral cancellation of investment treaties. The above bullet points exclude several mining royalty increases during this period. In fact, it appears that Mongolia has succeeded in annoying virtually all the world's major mining companies, not to mention creating a difficult operating environment for junior miners and many domestic mining companies too. In addition to the above, one might add the never ending infrastructure delays and, in particular, the indecision over building a rail link connecting Mongolian mines to the Chinese border. Given the above factors it is surprising that Mongolian mines have produced as much as they have in recent years, which is a testament to Mongolia's potential. However, it is not that surprising that more recently FDI in the mining industry has fallen and the economy has shown worrying trends. In addition, Mongolia has also had to contend with global commodity price falls and China's slowdown. It seems it is these factors that have forced the government to rethink its strategy towards inward investment. More recently there has been more positive news for mining companies in Mongolia. The new government is eager to restore investor confidence within the existing breathing space before the next election in 2016. · In October 2012, the Mongolian parliament passed a resolution authorizing the construction of Phase I and II of the country's new railway project. 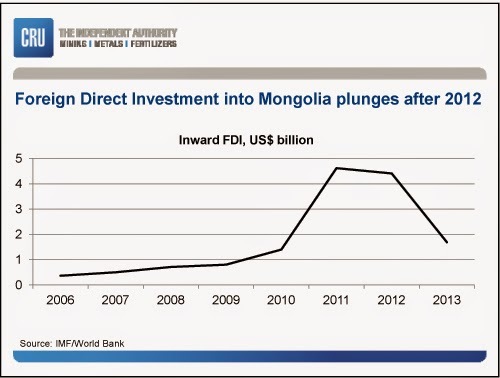 · In January 2013, New President Elbegdorj withdrew the hostile 2012 Mineral Law draft and a new Investment Law lifted significant restrictions on FDI. For example, royalty increases have been reversed, tax stability certificates have been introduced and local content rules waived. · Recent visits during August-September, 2014, by Xi Jinping of China and Vladimir Putin of Russia have led to new intergovernmental agreements that should assist Mongolia's land-locked position between China and Russia. Most important is a recent agreement reached with China allowing Mongolia a transit corridor through China. · Now in September 2014, the dispute between the government and Rio Tinto over Oyu Tolgoi appears to be close to resolution, which should open the way to significant direct investment and increasing confidence from outside investors. The above demonstrates the clear advances that have been made in government attitudes toward mining investments. However, CRU believes that the biggest challenge that Mongolia needs to overcome is that of developing the rail infrastructure to export bulk commodities competitively. CRU Consulting has examined the delivered costs of various bulk commodities into the Chinese market versus local Chinese prices, and concluded that logistical issues are of paramount importance. Sitting on great mineral assets is all very well, but these have to be delivered to the market competitively. When Mongolian mines are linked to the Chinese rail network freight costs for bulk commodities should be halved. Therefore, the development of the railways is likely to hold the key for Mongolia's successful development. Mongolian Rail (MTZ) has plans for two phases of rail investment which will run to 1800km, but the key section is the line from coal mines at Ukhaa Khudag (near Tavan Tolgoi) to the Chinese border at Gashuun Sukhait, which will connect to the Chinese rail network. Once completed, the capacity of this line south to the border is expected to be around 30 Mtpy. The slow progress on this 230km of line appears due to problems in raising finance. Almost half of the earthwork has been completed, but the gauge has still not been decided, and this project is understood to need more finance to continue. This rail project was due to begin operations from 2015, but is now behind schedule, so 2016 appears to be the earliest possible start date at present and this may be optimistic. A strategic investor is being sought and a sovereignty guarantee is needed to cover sovereignty risk for Mongolia. This issue is complicated, but one problem appears that the government wants majority ownership. In fact, this tension between government control and the desire for private sector investment is an ongoing issue in Mongolia across the whole mining sector. In conclusion, the Mongolian government now appears to be moving in the right direction. However, there are still many challenges and bottlenecks to overcome. Major challenges include improving the legislative regime, reducing harmful government interference, completing vital infrastructure and possibly most vital of all, being able to raise adequate finance. Nonetheless, CRU believes Mongolia is still in its early stages of development, presenting opportunities to many mining companies that do good due-diligence. To assist in further understanding the competitiveness of Mongolian projects CRU's Beijing office is very well placed to provide such analysis and advice and to help understand Mongolia's largest market south of its border. Ulaanbaatar, October 10 (MONTSAME) Afternoon session of the State Great Khural on Thursday ran a final discussion on approval of the draft resolution on state policy on medicines. The parliamentary draft resolution was presented by D.Sarangerel MP. The session ran a voting on the issue because the MPs did not have any questions on the matter, after which a majority approved this draft resolution. The next issue is a draft law on health insurance. October 10 (news.mn) The Citizenship and Migration General Authority of Mongolia launched an e-immigration project with intentions to build a migration registry and control system in the midst's of electron reforms. The agency now offers the latest technological services that meet international standards to allow civilians and vehicles to enter a border crossings and for foreign nationals to apply for visas and get a response online. The fingerprinting service was first launched at Gashuun Sukha in Umnugovi province border on April 14th. Drivers of vehicles are now able to cross border check points with the help of fingerprinting identification in as little as 20-30 seconds without getting out of their vehicles. The Citizenship and Migration General Authority of Mongolia plan to later launch the service in Buyant – Ukhaa and Zamiin-Uud borders. October 10 (CAPA – Centre for Aviation) With five aircraft, MIAT Mongolian Airlines is North Asia's smallest flag carrier. Mongolia in recent years has gained attention for double digit economic growth, including having the world's fastest-growing economy in 2011. Growth in 1H2014 slowed to about 5%, but even if this slower pace continues, there will be demand for air services as Mongolia seeks to win back passengers carried by foreign carriers, gain business through new markets and grow tourism. Against this background MIAT Mongolian Airlines, one of only two international Mongolian carriers, is steadily growing and renewing its fleet. But MIAT now faces competition from Mongolia's second international carrier, Hunnu Airlines. MIAT in 2014 supplemented its Moscow-Berlin service with a non-stop to Frankfurt in order to facilitate a greater range of transfers and take advantage of Frankfurt's transfer facilities, which do not require Schengen visas. MIAT's Beijing service was extended to Singapore in hopes of building business ties and also growing tourism. MIAT is considering launching flights to Bangkok and New Delhi while a new capital city airport that will open in 2016 with a transit area could give MIAT transit traffic flows from Europe to Asia over Ulaanbaatar. MIAT Mongolian Airlines is the flag carrier of Mongolia and is the largest Mongolian carrier. The only other international carrier, Hunnu Airlines, launched in 2011 with former MIAT employees. Hunnu originally launched as "Mongolian Airlines", capitalising on MIAT often shortening its full "MIAT Mongolian Airlines" name to just "MIAT". However, Mongolia put an end to the practice and "Mongolian Airlines" re-branded to "Hunnu Airlines". Hunnu has opened scheduled service to points like Bangkok and Shanghai Pudong that MIAT does not serve, but has also joined MIAT on the Hong Kong route. Hunnu has taken market share and MIAT has had to reduce capacity. Hunnu plans to acquire A330-200 aircraft to fly non-stop to Paris as well as Singapore. MIAT has beaten Hunnu to Singapore, but only with a service via Beijing. Hunnu also plans – perhaps optimistically – to fly to the United States. More realistically Hunnu plans to open scheduled service to nearby secondary cities in China and Russia. Hunnu also operates domestic services within Mongolia whereas MIAT no longer does. Hunnu expects to replace its ageing F50s withATR aircraft. Domestic services are also primarily fulfilled by Aero Mongolia, which does not fly internationally. Previous domestic carrierEznis Airways suspended operations in May-2014. Recent history has also seen six MIAT executives given jail sentences for at least 10 years due to money laundering convictions. 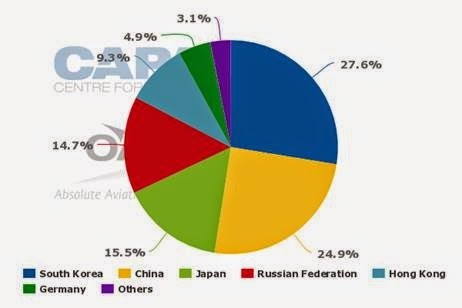 Three-quarters of MIAT's scheduled capacity in Oct-2014 is within North Asia. Korea is MIAT's largest destination, with MIAT only servingSeoul Incheon from Ulaanbaatar, MIAT's only point of departure in Mongolia. China (Beijing) and Japan (Tokyo Haneda and Tokyo Narita) are MIAT's second and third-largest markets. MIAT's business is highly seasonal as it caters to the peak northern summer period, which is the only main tourism season and is also when Mongolia has long holidays, allowing wealthier Mongolians to travel. 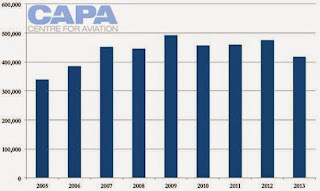 MIAT also conducts a number of charter flights which are not captured by scheduled capacity data. MIAT's fleet of five aircraft makes its North Asia's smallest flag carrier. Even North Korea's Air Koryo has over 10 aircraft. But in the context of MIAT's history, this is a significant development. An economic crisis and currency depreciation around the turn of the millennium nearly saw the carrier go out of business. The previous decade was slow for MIAT as it retired Antonov and 727 aircraft to settle for a fleet of one A310 and one 737-800, later expanded to two. The A310 was replaced with a second-hand 767 (now 18 years old, according to CAPA's Fleet Database). In 2013 MIAT took delivery of its second 767-300ER, this one direct from Boeing and its first purchase of Boeing aircraft. It was financed through the Ex-Im Bank in what was its largest transaction to date for Mongolia. A third 737-800 was delivered on lease in May-2014 and MIAT will take delivery of two 737-800s with the Sky Interior in 2016. MIAT has mooted taking 787s towards the end of this decade but there are no firm plans. MIAT operates its five aircraft in four different configurations, according to information from the carrier. Its newest 767, with angled lie-flat business class seats, seats 220 across 25 in business and 195 in economy. Its older 767 seats 263 across 18 in business and 245 in economy. Its 737-800s are in either a 174 (12 business, 162 economy) or 162 (12 business, 150 economy) configuration. MIAT does not release traffic information, but passenger volume for Mongolia is available. Mongolia saw 767,000 air passengers in 2013, a slight decrease from 2012's 770,000 passengers. Overall however passenger volume has nearly doubled since 2010, coinciding with Mongolia's economic growth, largely due to mining. Although this has created wealth, it has not done so equally. Domestic passengers accounted for 43% of total passengers in 2013, up from 28% in 2008. Domestic passenger numbers are up due to additional flights, economic wealth, but also upgrades to Mongolia's regional airports, some of which previously could not accommodate night landings. Mongolia's tourism statistics do not show the growth that might be expected given the increase in air traffic. In fact, Mongolia's 418,000 inbound tourists in 2013 was its lowest volume since 2006. These figures however are distorted by large decreases in Chinese and Russian tourists, two key source markets for Mongolia. There were only 74,000 Russian tourists in 2013, down from 99,000 in 2007. A Sep-2014 agreement to allow Russians visa-free travel to Mongolia should lead to an increase in visitors although in short order there may be a need for more flights from Russia. There were 178,000 Chinese tourists in 2013, down from 211,000 in 2007. This makes Mongolia one of the few countries to experience a decrease in Chinese tourists over that period. MIAT's route network largely stagnated until it opened a Hong Kong service in 2011, which MIAT says was its first regular new route since 2002. More recent years have seen increased charter activity (mainly to China, Japan and Korea points) and frequency growth, the latter often facilitated by expanded air service agreements. 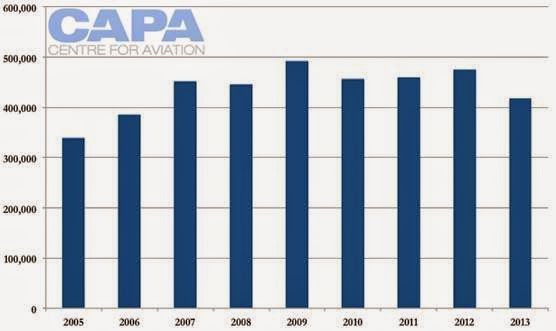 2014 saw MIAT expand its scheduled business with new or resumed points. This growth comes as Mongolia's economy slows down, prompting MIAT to warn it is "facing economic downturn in its business activities", although this perhaps should be placed in perspective as Mongolia's economy is still growing, but not at the record-setting rate it used to. Competition from Hunnu Airlines is undoubtedly a factor although not mentioned. MIAT is looking to establish a mid-term business plan covering 2015 to 2017. In Oct-2013 MIAT signed an MOU with Lufthansa Consulting. A Mongolian newspaper reported in Jan-2014 that MIAT is considering listing 49% of its shares in Hong Kong in line with the Mongolian government privatisation of state-owned companies. There has apparently been no further statement, but privatisation would bring the substantial benefit of allowing MIAT to function as a commercial business, although there is a risk the state could continue to meddle in MIAT's affairs. MIAT has long relied on Moscow and Berlin as its European points, which MIAT attributes to business ties with Moscow and Berlin's sizeable (relatively) Mongolian expat community. Berlin has typically been served as a tag from Moscow with local uplift rights in both directions. MIAT also offered limited non-stop service to Berlin, including over northern summer 2013, but in northern summer 2014 instead had twice-weekly non-stop 767-300ER scheduled service to Frankfurt. MIAT had served Frankfurt (via Moscow) early last decade. MIAT opened the scheduled route in part to take advantage of Frankfurt's transit facilities. The transit area at Frankfurt allows passengers to transit without a Schengen visa, which would be required at Berlin Tegel, as it does not have transit facilities, although MIAT in Aug-2014 entered into an interline agreement with airberlin to provide onward flights to elsewhere in Europe as well as to North America. MIAT is also targeting rail connections from Frankfurt's connected train station. It is unclear how MIAT fared on the Frankfurt route. The only other European service to Mongolia is provided by Aeroflot (daily over the peak summer, and cutting down to as little as twice weekly, non-stop from Moscow) and Turkish Airlines (three weekly on an Istanbul-Bishkek-Ulaanbaatar routing with local pick up rights between Bishkek and Ulaanbaatar in both directions). The only foreign carriers serving Mongolia are Aeroflot, Air China, Korean Air andTurkish Airlines. Aeroflot and Turkish Airlines often carry passengers from Europe while Air China and Korean Air carry passengers from North America. Korean Air also targets the small outbound Mongolian market to warm beach destinations. In 2013, China (178,326 tourists) and Russia (74,468) accounted for 60% of tourists to Mongolia. Korea was a distant third (45,178) followed by Japan (18,178) and the US (14,701). Sixth was Kazakhstan (11,422) and seventh Germany (9,499). Turkey contributed 2,720 visitors (although this was up from 851 in 2010. France, where Hunnu Air in 2014 launched Paris service with a technical stop, saw 7,407 tourists to Mongolia in 2013, making the France the next largest European market after Germany. France and Germany each saw about twice as many total visitors (including those for tourism, business and other visits) to Mongolia. The France service was Hunnu's first outside of Asia. MIAT in Sep-2014 extended its Beijing service to continue to Singapore twice weekly, with the tag flight operated by 737-800s (with payload restrictions) with local pick-up rights. MIAT says there are about 180 Mongolians working in Singapore whereas the Singapore Tourism Bureau says 8,000 Mongolians visited Singapore in the year to 31-Jul-2014; statistics on previous years are not available. MIAT says it is studying new routes to Bangkok and Delhi. Bangkok is already served by Hunnu Airlines with twice-weekly A319 flights.Thailand does not break down visitors from Mongolia. MIAT has given mixed signals on long-haul routes, saying service to North America is unlikely or only a long-term objective and at other times saying there are more immediate plans for North America – and Australia. MIAT has two codeshare partners: Aeroflot and Korean Air. Air China in May-2014 released a brief statement saying it hoped to expand cooperation with MIAT. China Eastern in May-2013 released a statement saying it signed an MOU with MIAT to help MIAT join SkyTeam, but SkyTeam quickly backed away from this odd announcement. Mongolia in 2016 expects to inaugurate a new main international airport for the country at Khöshigt Valley, some 50km from the Ulaanbataar city centre. In comparison, the current airport is 18km from the city centre but expansion is hindered by nearby mountains. The new airport will allow for international transit without visa, and MIAT has flagged this will allow it a role in Europe-Asia traffic flows. Such traffic however is best as supplementary, and in particular to be larger during the off-season. Given MIAT's overall limited frequencies that stifle timely (and even same-day connections), it is difficult to see transit traffic help significantly sustain new services. MIAT is torn between high-volume peak season and low-volume off-peak season, the former supporting widebodies and the latter not. MIAT in the 2013 off-season leased a 767 for Hajj services. MIAT's longest service, to Moscow, is just over six hours, placing it within range of narrowbodies even with some payload restrictions (Aeroflot uses A320s between Moscow and Ulaanbataar). There is some precedent with Air Astana and Icelandair successfully relying on narrowbodies (and next-generation ones) to connect continents, although these two are focused on connecting traffic: North America-Europe for Icelandair, and Asia/Europe-West Asia for Air Astana. Icelandair however generally has more frequencies across its network than MIAT. Air Astana has a niche around West Asia (MIAT's North Asian backyard is well-served) and Air Astana does not explicitly target Asia-Europe connections. MIAT in fact had been considering 757s last decade, but widebodies won out, despite being analysed at the time as too big for the long off-season. It is difficult to see MIAT and Mongolia become a Europe-Asia transfer hub. Mongolia may be better off foregoing the appeal of widebodies and instead focusing on its narrowbody operation while supporting foreign carriers who can more efficiently provide long-haul services. There is scope for partnerships to expand and cover additional points beyond other carriers' hubs. Korea in 2011 accused Korean Air and MIAT of keeping Seoul-Ulaanbaatar fares high and stifling other carriers from entering; Korean Air said the issue was the bilateral preventing another carrier from being designated on the route. For MIAT, easy does it. CANNES, October 12 (World Screen) Saban Brands' Power Rangers Super Megaforce has been licensed by Mongol TV, marking the first time a Mongolian company has licensed programming rights for the hit show. The newest iteration in the Power Rangers franchise will make its debut on Mongol TV in December. The channel has a reach of 3 million-plus viewers in Mongolia. Nomin Chinbat, the CEO of Mongol TV, said, "Mongol TV is very pleased to enter into this exciting partnership with Saban Brands to acquire the Power Rangers series, one of the top kids' programs in the world. We look forward to broadcasting the popular show, the first time in Mongolia." Ulaanbaatar, October 8 (MONTSAME) The Mayor and the governor of Ulaanbaatar E.Bat-Uul called Wednesday for immediate discussion among the city administrators to sound his position over the state draft budget for 2015. "If this draft adopted, the city's construction will stagnate," he said. "Shocked with this unprecedented version of a draft budget", he said the Premier "has been neglecting the addressing of this issue repeatedly and has presented such a draft that will stop all the daily works and constructions of the city". According to this draft, he went on, Ulaanbaatar will have to spend its yearly budget of 450-500 billion Togrog for salaries of teachers, health and culture sectors personnel and routine maintenance. "It is impossible, because Ulaanbaatar cannot providing some 330 billion for the above costs, it will make the city go bankrupt,' he stressed. He also informed the gathered about his intention to present an official letter regarding the issue to the Speaker Z.Enkhbold. In case this draft is approved by parliament, "I will not--for the sake of interests of the UB people--present the draft to the Citizens Representatives Khural of Ulaanbaatar", he said. October 6 (infomongolia.com) The Government of Mongolia and the Asian Development Bank (ADB) have agreed to start the "Bogdkhan Railroad" project and in the frameworks, the ADB to provide 500 million USD soft loan and in addition, 550 thousand USD grant aid to spend for the Project studies. The Project Finance Memorandum was signed between Acting State Secretary at the Ministry of Roads and Transportation, Mr. Yo.Manlaibayar and ADB Senior Transport Specialist, East Asia Transport Division, Mr. Sharad Saxena in Ulaanbaatar on October 03, 2014. In the scope of the "Bogdkhan Railroad" project along the south of Bogd Khan Mt., a new railway between Rashaant station in Batsumber Sum and Maanit station in Bayan Sum of Tuv Aimag will be constructed and this route will pass close the newly being constructed the International Airport in Khushigt Valley. In addition, the freight and passenger transportation flow between Russia and China running through Ulaanbaatar will be stopped and this 35 km railroad via UB will be utilized for only rail-bus public transportation purposes. Besides, traffic congestion in the city would be comparatively decreased that blocks intersections on scheduled timetables and would also help to reduce air pollution, officials say. Moreover, the territories along the city railroad for 11 logistics terminals and 102 sub-roads for freight loading and unloading services that altogether occupy over one thousand ha will be emptied out for housing, service centers and schools and kindergartens. The initial "Bogdkhan Railroad" project to construct 170 km was planned to connect Mandal and Bagakhangai stations in Tuv Aimag. October 8 (The Asia Foundation) Ahead of a major forum on transparency and corruption in Mongolia's capital of Ulaanbaatar this week, Capital City Governor and Mayor Bat-Uul Erdene set the tone for the discussions: "In Mongolia, corruption is so common that it has become a kind of social norm. In the end, it makes the state turn against the interests of the public. The state becomes the enemy of its own people. It ruins the main principles of democracy." On October 6-7, Mayor Bat-Uul, with the support of the International Republican Institute and various other organizations, hosted the "Transparent Ulaanbaatar 2014: Anti-Corruption Forum," which brought together more than 200 guests from 16 countries including keynote speaker Dr. Larry Diamond, senior fellow at Stanford University's Hoover Institute and the Freeman Spogli Institute for International Studies, as well as attendees from city and national government, civil society, the business community, and academia to discuss ways to help combat corruption in Ulaanbaatar. Despite a strong commitment to combating corruption including national legislative and institutional reforms over the last few years, Mongolia continues to rank among the most corrupt countries in the world, according to international indices. As a resource-rich country with a population of just 2.9 million (the world's most sparsely populated country), Mongolia is particularly vulnerable to grand corruption, conflict of interest, and petty corruption in selected service sectors such as health and education. With almost 50 percent of the country's population living in Ulaanbaatar, what happens in the capital drives the country's success – or failure – at combating corruption and increasing transparency. Mayor Bat-Uul hosted this dedicated forum to demonstrate his commitment to ensuring these efforts succeed. · To help resolve one of the most publicly disputed issues in Ulaanbaatar – land permission and issuance – we worked with the city's Land and Property Office to digitize over 150 land demarcation maps out of which 20 maps for central district khoroos (neighborhoods) have been uploaded onto the city's land and property office website. These maps and database provide information about public lands and serve as an important mechanism to prevent potential disputes over land. Over 40,000 pages of documents on land-related decisions were scanned and digitized and uploaded to the website and have also been transferred to the city archive agency. · To meet access to information law requirements and ensure the public is informed on land and property issues, we have worked on the production of 24 information transparency boards. These boards were installed at 10 district land and property offices, and 11 health offices/hospitals and head offices of main agencies. The boards will enable agencies to provide and update their human resources and budgetary information in an open and accessible manner for citizens. · Collaborated with the City's Law Department to develop an integrated database containing key decisions and city legislation made by the Capital City Citizens' Khural, the Governor's office, and the City's nine districts and agencies. Currently, over 16,000 decisions from the mayor's office and the Citizens' Khural have been entered into the database. · Supported an awareness-raising campaign for 1,400 employees of 12 offices, 26 district hospitals, and 98 primary schools. Additionally, two trainings on anti-corruption legislation, transparency, and auditing were organized for over 100 management-level officials and other employees of the city. · Organized a workshop in collaboration with the Ministry of Education and the City Education office at nine high schools across Ulaanbaatar for 17 history and social science teachers. The workshop focused on teaching the subjects of justice and anti-corruption to 2,500 6-11th grade students for three months during the winter semester of 2013-2014. Also, as a result of the workshop, a new draft teachers' ethics code was developed that sets standards of good conduct. Many of these initiatives came up at the forum during the panel discussions on ways that civil society and public institutions can enhance transparency and accountability, the institutional mechanisms that can be used to prevent and combat corruption, and the localized solutions and initiatives that the city and civil society are currently implementing. The results of the sessions were presented at a closing plenary session and will feed into the development of an upcoming Ulaanbaatar Action Plan to address corruption. At the end of the Forum, the mayor signed the Ulaanbaatar Declaration Against Corruption, reaffirming the city's commitment various anti-corruption measures including a "Smart City Government" that is transparent, just, corruption-free, ethical, close to its citizens, and participatory. Transparent Ulaanbaatar adopts "Ulaanbaatar Declaration on Anti-Corruption"
Ulaanbaatar, October 8 (MONTSAME) A "Transparent Ulaanbaatar" international anti-corruption forum adopted the "Ulaanbaatar Declaration on anti-corruption" on Tuesday here. The first forum ran October 6-7 at initiative of the UB city Mayor with a participation of 258 representatives of 18 countries. The city administration considers the above document as a step toward achieving a goal to become a corruption-free city in the region and in the world. One of the key lectors of the forum Larry Diamond, a professor of Stanford University said the Mayor's bravely voicing against the corruption and studying experiences of many countries is not only a new initiative but also a new political phenomenon. "Two-day forum cannot eliminate the corruption, but an experiences sharing and the Declaration adopting were crucial solutions," he added. A president of the co-host the International Republican institute Thomas Garrett thanked the representatives of civil societies for their active participation in the forum. "This is one of the reasons of our co-hosting this event, because cooperation with civil societies is an important approach in the anti-corruption fight," he said. The institute implements such projects in over hundred countries, and "we will closely cooperate with Ulaanbaatar in the future," he said. October 8 (news.mn) The administration of Mongolia will enact a national strategy providing a plan for traffic safety and security from 2012-2020. According to the strategy, speed limits for motor vehicles on city roads will be decreased to as slow as 30 km/h in 2015, and 45 km/h in 2020. In the cases where two lanes are reduced to one, the lane being reduced has to let cars merge appropriately. If done suddenly this can sometimes lead to unexpected and dangerous lane switching causing serious accidents and road rage. In such situations some countries have implemented a strategy called the zipper method to merge traffic safely. The zipper method is a way of reducing traffic down to one lane safer. The Ministry of Roads and Transportation has collected votes from relevant state agencies and ministries for a resolution to reduce traffic congestion and increase flow. This draft will propose the zipper method merging strategy on city roads to reduce heavy traffic jams and increase traffic flow. The drafted resolution will be introduced to the government for approval. October 8 (infomongolia.com) On October 03, 2014, a groundbreaking ceremony to build a recycling plant to process construction waste was held at the landfill site namely Naran in Ulaanbaatar. This plant will be constructed with 100% of investment from South Korea and at the ceremony the UB Administration headed by General Manager B.Badral and Korean delegates from relevant organizations working on environmental were also present. The plant with capacity to crush 1,500-2,000 tons of construction waste up to 5 mm and following washing and milling procedures, the basic raw materials will be extracted up to 0.7 mm. After which, the ready raw materials will be mixed with cleaned ash and other substances to produce the end product for road side curbs, paving, bricks and other purposes. According to officials, the plant will be operational in May 2015 and it estimates to recycle 61,084 tons of construction waste in winter period and 127,428 tons of waste in summer to ensure a healthy and safe environment. October 7 (news.mn) The city of Ulaanbaatar successfully hosted the first international conference on Northeast Asian Security titled "Ulaanbaatar Dialogue" on June 17-18th in 2014. In collaboration with the Mongolian Institute for Strategic Studies, the Ministry of Foreign Affairs of Mongolia published a summary of speeches delivered during the conference in English. Key speakers of the Ulaanbaatar Dialogue gave 21 speeches during four different panel sessions. The conference represented 35 participants from 10 countries including Mongolia, Russia, China, Japan, South Korea and North Korea, in Northeast Asia, as well as the USA, Great Britain, Germany, and Netherlands. All of which have strong influence on the region. Participating countries at the conference applauded Mongolia as a competent country in the region of Northeast Asia who was successful in holding a dialogue on these challenging issues. October 10 (infomongolia.com) The XII Intergovernmental Meeting on Partnership between Mongolia and the Republic of Finland in Economical, Sciences, Technical and Social Cooperation was held at the Ministry of Population Development and Social Protection of Mongolia in Ulaanbaatar on October 09, 2014. The Intergovernmental Meeting was chaired by Minister of Population Development and Social Protection Mr. Sodnomzundui ERDENE on behalf of Mongolian side and the other part by Under-Secretary of State responsible for External Economic Affairs at the Ministry for Foreign Affairs of Finland, Mr. Matti Anttonen. At this meeting, one of the issues focused was collaboration in the forestry sector and in the frameworks, parties negotiated to cooperate in forestry, fish farming and staff training in forestry sector to carry out by Finnish Forest Research Institute and Ministry of Environment and Green Development of Mongolia. Also, the sides agreed to develop a joint project on reindeer husbandry development to increase the number of heads and improve the livelihoods of reindeer herders. Besides, to study opportunities in eco-friendly transportation and its maintenance service and technology in winter period as well as to train Mongolian road engineers. Moreover, parties came to solution on conducting joint trainings to compare the two countries' service standards in social protection and to introduce European standard into Mongolia, to establish Memorandum of Understanding with the National Institute for Health and Welfare of Finland and to collaborate in social marketing, social insurance and cooperation in technical and technological assistance that aims to provide social service from home. Ulaanbaatar, October 10 (MONTSAME) The President of Mongolia Ts.Elbegdorj will take part in the 10th Summit of the Asia-Europe Meeting (ASEM) to be held on October 14-15 in Milan, Italy. After participating in the ASEM Summit, the President will pay official visits to Austria and Hungary on October 14-18. With a goal to intensify the Asia-Europe strategic dialogue based on equal partnership and mutual trust and the mutually-beneficial cooperation, the ASEM Summit is expected to be attended by state and governmental leaders of 49 countries; leaders of the European Union; and the Secretary-General of the ASEAN. During the official visit to Austria, the President will hold official meetings with his counterpart Mr Heinz Fischer; and the President of the National Council Ms Doris Bures. In Vienna, he will leg the UN Headquarters and will make opening remarks at a Mongolia-Austria business forum. Within the visit to Hungary, Mr Elbegdorj will meet with his counterpart of the country Mr Janos Ader; the Hungarian Prime Minister Viktor Orban; and other officials. Then he will visit the Center of Mongolian Studies at the Eotvos Lorand University, and will open a Mongolia-Hungary business meeting. He also will give a lecture themed "Mongolian democracy and lesson" at the University of Central Europe. Ulaanbaatar, October 9 (MONTSAME) A parliamentarian R.Amarjargal has taken part in the 8th Asia-Europe Parliamentary Partnership (ASEP) Meeting which was held October 6-7 in Rome, Italy. Mr Amarjargal gave a report on Mongolia's development policy, economy and investments at a meeting themed "The Role of Parliaments in Fostering Europe-Asia Dialogue, Sustainable Growth, and Stronger Governance Structures". Then he reported that Mongolia proposed hosting the 9th meeting of the ASEP in Ulaanbaatar. With parliamentary leaders and delegates from some 40 countries, the ASEP Meeting in Rome discussed a structure of economic and financial governance and issues of sustainable development and food safety. It released a declaration to be submitted to the ASEM Summit. Ulaanbaatar, October 10 (MONTSAME) State Secretary of the Ministry of Justice J.Bayartsetseg Friday received Mr Alexey Lyzhenkov, the Department of Transnational Threats co-ordinator of the Organization for Security and Co-operation in Europe (OSCE). The sides have discussed a current status and future perspectives of cooperation between Mongolia's Ministry of Justice and its agencies, and the Transnational Threats Department of OSCE. They also emphasized possibilities to collaborate on legal innovations. Opinions has been shared on cooperation and exchange of practices with the members and partners of the OSCE in the future, in customs control management, and combating human trafficking, the Internet security, and illegal use and circuit of narcotics and drugs. The OSCE is the biggest security organization in the region, with 57 member countries from Europe, America and Asia. Mongolia has acquired a full membership to the organization in 2012, and has since been cooperating with it on maintaining regional security, forming a system ruled by law, protecting and cherishing human rights and freedom, and on providing economic and environmental security. October 9 (infomongolia.com) Today at 01:30 pm on October 09, 2014, the Conference themed "The Role and Significance of Honorary Consuls in the Foreign Relations of Mongolia" will begin at the Ministry of Foreign Affairs in Ulaanbaatar. This is the first event involving Honorary Consuls representing foreign states to Mongolia organized by Institute for International Studies (IIS) and the Conference will be opened by Foreign Minister L.Bold and key speech on "First Honorary Consuls to Mongolia and the role and future opportunities" by Honorary Consul of the Kingdom of Thailand to Mongolia L.Lkhagvaa. After which, lectures will be delivered by IIS Vice Director PhD A.Nyamdorj, Vice Director of Consular Department at the Ministry of Foreign Affairs N.Bataa and Honorary Consul of the Republic of Chile to Mongolia D.Puntsag. October 9 (infomongolia.com) President of Mongolia Ts.Elbegdorj temporarily appoints Mr. Luvsandandar KHANGAI, who owns a diplomatic title of Ambassador Extraordinary and Plenipotentiary, as the President's Envoy as a Head of Mission responsible for Economic, Infrastructure and Investment issues in the Russian Federation. L.Khangai was born in 1956 in Ulaanbaatar. He holds degrees in law from National University of Mongolia and political science from Moscow Social Science Academy. He is an experienced public official with rank of Senior Officer, who completed trainings in Australia, Germany, South Korea and Sweden. In 1979-1988, L.Khangai worked as an expert and Head of a division at the Ministry of Justice, Vice Chairman at the Secretariat of the State Baga Khural of Mongolia in 1990-1992, First Under-Secretary General at the Secretariat of the State Great Khural in 1992-1994, Director General of "Chinggis Khaan" Hotel in 1994-2000. First Deputy Head of the Cabinet Secretariat of Mongolia in 2000-2005, Ambassador Extraordinary and Plenipotentiary of Mongolia to the Russian Federation in 2005-2009, and Head of "Russia Foundation" NGO since 2009. October 7 (East Asia Forum) The close timing of Chinese president Xi Jinping's and Russian president Vladimir Putin's recent visits has led a number of analysts to claim Mongolia has abandoned its 'Third Neighbour' diplomacy — a long-held policy to build relations with non-border countries — for a consortium with Beijing and Moscow. Pointing to Mongolia's uneven economic relations with Beijing, dependence on Russian oil and gas imports and slowing growth, these analysts argue that Mongolia has 'rebalanced' to China and Russia out of necessity. But this reasoning is not only short-sighted, it also represents a fundamental misreading of trends in Mongolia's domestic and foreign affairs. Closer consideration of current developments in Mongolia reveals a different story. Mongolia's tactics should not be conflated with its strategy. Since 1994, Mongolia's foreign policy strategy has been to ensure its national security and economic growth through widespread engagement with as many states as possible. Mongolia's engagement with China and Russia — both neither new nor all-encompassing — is a tactic to achieve this strategy, not a strategy itself. Mongolia maintains similar tactical contacts with states as diverse as Canada, Turkey, India and Japan. Often misunderstood, Mongolia's Third Neighbour Policy is a three-part strategy of economic, political and military engagement. The tactical economic engagement with China (supposedly the main indicator for the 'rebalance' thesis) is just one limited component of Mongolia's overall foreign policy approach. Mongolia maintains deep political engagement with a wide range of states and international institutions, including Japan, Germany, Hungary, South Korea, North Korea, and the United Nations. The military component also remains robust, particularly in relation to the United States and the UN. If anything, these aspects of the policy have strengthened as multilateral economic exchange has weakened. The third neighbour approach is not simply a policy preference; it is a national security priority. Both the 2010 Foreign Policy and National Security Concepts identify diversity in economic, political and military relations in security terms and assign the state the responsibility to maintain such diversity. Any deviation from the policy would not simply be a matter of contingency. It would be fundamentally abandoning the state's role in national security. Mongolia's lower GDP growth — resulting from a slowdown in mining and falling global commodities prices — does not mean politicians have no choice but to look to their immediate neighbours for support. Besides rising inflation, the current economic slowdown has not affected rising living standards as few directly depend on the mining sector for their livelihood. The majority of urban Mongolians make their living from sectors that have developed outside of mining, including agriculture, tourism, construction and services. While a long-term downturn in mining would affect these sectors and result in a lower tax base, as yet, the slowdown's effects are limited to the hyper-wealthy who are commercially involved in the mineral sector. If anything, the slowdown is contributing to a more egalitarian, balanced economy that is not solely dependent on the natural resources sector. It has not led to a sudden sense of weakness. Mongolia has long needed more balanced growth and will benefit from it in the long term if the country's leaders enact the right policies. Mongolian leaders do not have the ability to enact policy that runs counter to public opinion without consequence. The majority of the Mongolian people support the third neighbour approach, whether as a specific policy or guiding principle. They are anxious to avoid dependency on China and keen to develop ties with countries like South Korea, Japan and the United States, as well as communities like the European Union. This preference is evident both in annual public opinion polls — in which Mongolians consistently rate China as the least desirable country with which to build closer relations — and the ubiquity of Western consumer goods. Any Mongolian politician that realigned the country's foreign policy against these preferences would open himself to charges of betrayal — a risky business for a politician in a democratic country. The 'rebalance' thesis fails to consider Mongolia's relations with China and Russia from either Beijing's or Moscow's perspective. Both China and Russia are engaged in proactive diplomacy toward Mongolia, and other periphery states, for their own foreign and domestic reasons. Chinese president Xi Jingping has travelled to most of the states in Central and Inner Asia as part of his new periphery diplomacy. China is working to convince these same states to support its New Silk Road initiative, through which it seeks to expand its economic and diplomatic influence into Central Asia and onto Eurasia. Similarly, Russia is intent on re-establishing its influence in Central and Inner Asia through economic and diplomatic engagement. Moscow's own 'rebalance' to Asia is even more important following economic sanctions from the West over Ukraine and Russia's self-perceived need to compete with China in areas over which the Soviet Union either had direct control or maintained influence. Taken together, these points illuminate the current 'rebalance' argument's failings. Mongolia is not in the process of abandoning its relations with other states for the sake of a trilateral agreement with China and Russia. Instead, the nature of its foreign policy is undergoing an internal tactical shift. Economic ties with China are deepening and political and military linkages with the West are growing. This diversity of interaction is at the heart of Mongolia's Third Neighbour approach and is a clear indication the strategy is alive and well. MIBG: Which Neighbour Is The Best? October 9 (MIBG) Since 1994, Mongolia's foreign policy strategy has been to ensure its national security and economic growth through widespread engagement with as many foreign bodies as possible. However, this plan seems to be continuously postponed as the country's short-term goals have become more drastically pressing and in need of resolution. Both China and Russia are engaged in proactive diplomacy toward Mongolia, and other periphery states, for their own foreign and domestic reasons. Chinese president Xi Jinping has travelled to most of the states in Central and Inner Asia as part of his new periphery diplomacy, which seeks to expand China's economic and diplomatic influence in Central Asia and Eurasia. Similarly, Russia is intent on re-establishing its influence in Central and Inner Asia through economic and diplomatic engagement. Moscow's own 'rebalance' to Asia follows economic sanctions from the West concerning the Ukraine and Russia's self-perceived need to compete with China in areas where the Soviet Union either had direct control or has maintained influence. This discussion was at the center of a presentation given by the Speaker of Parliament, Z. Enkhbold, at the Investor Conference held in Ulaanbaatar yesterday by the North America - Mongolia Business Council (NAMBC). In his presentation, Mr. Enkhbold discussed the merits of strengthening relations with both Russia and China. The economic potential of partnering with these two nations is vast, and the opportunity to create a mutually beneficial economic corridor through Mongolia offers a wide range of economic and social benefits. That said, Mr. Enkhbold also discussed the need for balancing these relations through third neighbours. He pointed to the development of an Economic Partnership Agreement (EPA) with Japan and a prospective Free Trade Agreement (FTA) with the United States as examples of their commitment to this approach. By establishing two concrete trading partners, we believe that Mongolia has cemented a stable growth method that will eventually lead to economic stability. After the Mongolian government is well established, opportunities to increase bilateral trade with more diverse partners will arise. A bilateral-trade agreement has already been signed with Japan and talks have been ongoing with several other countries. Although increasing economic reliance on China and Russia provides the two governments with considerable power over Mongolia's economy, the growth tactic is necessary and relatively stable. Steady growth is essential to the current Mongolian economic model that will eventually lead to more prospective opportunities like a third neighbour approach with a diverse range of countries from Korea to Hungary. October 6 (Asia-Pacific Center for Security Studies) Why would a counter terrorism policy matter in a country where terrorism isn't a major threat? Dr. Jeffrey Reeves looks at the long-term benefits of Mongolia's counter terrorism law in his latest paper: "Mongolia's Counter-Terrorism Architecture: Implications for Domestic Development and Foreign Partnership." October 9 (Global Research) Nestled between Russia and China, Mongolia is a geographically obscure country with the sparsest population density in the world. It isn't exactly what comes to mind when one thinks of East Asian or Pacific economic opportunities, yet for Russia, Mongolia is the key that it needs to unlock strategic relations with South Korea. Ulaanbaatar's unique Third Neighbor Policy has allowed it to cultivate favorable relations with Seoul, and coupled with its valuable coal reserves and rare earth minerals, it has just the type of resources that South Korea needs. By bridging the geographic divide between the two, Russia stands to gain by entering into a strategic and multifaceted partnership with South Korea that proves the seriousness of its Pacific Pivot and could potentially transform Northeast Asian affairs. Mongolia has historically been in the Russian sphere of influence, but after 1991, the country spearheaded the so-called Third Neighbor Policy to diversify its relations in the post-Cold War world. This saw it reaching out in economic, political, and military (although largely benign) ways to distant partners such as the EU and NATO, as well as closer ones such as Japan and South Korea. The guiding philosophy behind this policy was that Mongolia did not want to be dominated by either Russia or China, the latter of which it secured its independence from in 1911 after centuries of control. This concept will be important in later understanding Mongolia's anticipated role in bringing together Russia and South Korea. Mongolia has thus been faced with the dilemma of interacting with the wider world while still being dependent on its neighbors for physical trade networks. Although securing significant natural resource investment from leading Western companies such as Canada's Ivanhoe Mines and the UK's Rio Tinto, it still sells 90% of its natural wealth to China, creating just the type of dependency that it had earlier sought to avoid. The fact that 20% of Mongolia's GDP is dependent on mining, and growth in this field has allowed the country's GDP to be the world's fastest growing since 2012 (and expected to remain among the top for the coming years), reinforces the dominant role that Chinese mineral purchases have on the overall Mongol economy. There are concrete reasons why Mongolia's mining sector (and consequently, the mainstay of its economy) became dependent on China. Way more than rare earth mineral demand (of which China is already dominant), this has to do with China's insatiable appetite for coal. Bluntly put, Mongolia is nothing more than a raw resource appendage of China and has little purpose for Beijing besides helping to keep the lights on. Nonetheless, this arrangement was beneficial for Mongolia, so long as China kept buying coal. At the same time, though, this may be rapidly changing in the near future. For the first time, China's coal consumption has actually decreased by 23% year-on-year for August-September as the government implements cleaner energy policies and diversifies its electricity generation to natural gas and other means. Although ideal for China, this will be disastrous for Mongolia, seeing as how intricately its mining sector (and by degrees, its entire economy) is dependent on Chinese coal consumption. Whereas in the past coal was treated as a king in Ulaanbaatar, now it appears to be a curse, and the country desperately needs to diversify its consumer base to stave off economic destabilization and possible social and Color Revolution-influenced unrest. As all of this is happening, larger global processes are at play. Russia has set a grand aim of becoming a Pacific Power and moving away from its previous European economic interdependence, and in light of recent East-West tensions and subsequent sanctioning, this has taken on a more pressing urgency than ever. Concurrently, South Korea, wedged between heavyweights China and Japan, is growing at a consistent rate and is on the prowl for energy resources to fuel this into the future. 97% of its energy is foreign-sourced, and its import of coal, already at 80 million tons a year, is expected to rise to 128 million by 2018. Thus, the situation is presented where Russia wants a more active East Asian presence, South Korea is thirsting for energy, and Mongolia has the world'slargest untapped coking coal deposit. It is through this confluence of factors that the three actors are uniting their interests, with Mongolia being the middleman via its Third Neighbor Policy, which allowed it to jointly develop positive relations with both Russia and South Korea and thus make the entire arrangement workable. Within this structure of interests, Russia took care to avoid upsetting its global strategic partner, China. It signed an historic natural gas deal in May to supply it with nearly half a trillion dollars' worth of energy for 30 years, thus assisting with Beijing's plans to replace coal with natural gas during this timeframe. This massively important tradeoff is advantageous for China and placates any fears or jealousy that it may have over Mongolia's future trade links with South Korea. Additionally, Russia, China, and Mongolia have announced their intent to economically cooperate in a trilateral framework and create an economic corridor, showing that no bad blood exists between any of these actors. As is thus seen, Russia has taken delicate steps to ensure that Beijing would not be perturbed by its Mongolia-enabled outreach to South Korea, as such a move, in line with the practice of the Russian-Chinese Strategic Partnership, would increase the strategic influence of both Moscow and Beijing if successful. Going back to the Mongolia's role in connecting Russia with South Korea, the heart of it all rests in a proposed railroad project to link Mongolia's Gobi desert coal deposits to Russia's Pacific coast. Afterwards, the coal would be loaded onto ships for transport to South Korea and possibly Japan. Leading Australian companies already fear that the opening of Mongolia's coal resources to the East Asian market would be a game-changer and could possibly push them out of the market, indicating the enormous impact that this project would have if successfully implemented. Although rail links already exist between Mongolia and China, as stated earlier, the former is trying to cut its future dependence on the latter and understands the additional influence that Beijing would have if the line ran southeast instead of northeast. Also of importance, Mongolia's expected customers, South Korea and possibly Japan, would be hesitant to know that a growing percentage of their energy imports are indirectly controlled by China. That being said, the proposed railroad through Russia takes care to respect the geopolitical sensibilities of its intended East Asian client(s). Projecting even further, the East Asian coal market is only one of the many spheres that would be fundamentally altered by the proposed Mongolian-Pacific railroad. One of the most breakthrough results of this would be the creation of a Russian-South Korean strategic partnership. Although Russia would be playing a physically passive role in the Mongol-South Korean energy relationship simply through allowing the railroad to traverse its territory, it will still have prized access to influential South Korean companies, investors, and government figures who are involved in its construction. As Russia naturally needs investment in its Far East and South Korea has a hunger for energy besides coal, this could open the prospect for South Korean investment in the region in exchange for Russian natural gas exports, most likely through LNG, of which Seoul is the world's second-largest importer. Of relevant note, South Korea's demand for natural gas is expected to increase 1.7% annually until 2035, meaning that both Russia and South Korea now have the perfect time to work out an energy deal as significant and historic as the one between Russia and China (possibly even involving the promise of a share of Artic gas resources in the future). The strategic partnership between the two states would then take on a larger significance. The demonstration effect of the booming Russian-South Korean energy trade could possibly convincerecalcitrant Japan to abandon its blind loyalty to its American overseer and concede its Kuril Islands claims in exchange for a similar and much-needed deal as well. Additionally, South Korea is at the center of the US-China-Japan nexus in Northeast Asia, and by moving closer to Russia, it can expand its foreign policy importance and serve as the perfect conduit between all four actors in this region. By integrating Russia more closely into the region and its affairs, it could give it a greater stake in the peninsula's future, thereby possibly motivating it to seek a diplomatic breakthrough in the North Korean nuclear talks. With Russia returning to the Korean peninsula, no matter in which form this takes (diplomatic, energy, political, economic, etc. ), it would place the US on the strategic defensive in Northeast Asia and show that Russia has succeeded in pivoting to the Pacific. It is of absolute importance for Russia's future that the country move as rapidly as possible to the burgeoning Asia-Pacific region. Although China is a steadfast and loyal strategic ally, by itself, bilateral relations between the two do not constitute a proper Pacific Pivot for Russia. Instead, what is urgently needed is for Russia to enter into a strategic relationship with a non-Chinese partner that can immediately accelerate full-spectrum relations between the two. This is where South Korea comes in, but the key to accessing that country's decision makers and business leaders is to provide them with something that they too urgently need, and this is Mongolian coal. By acting as a conduit between Mongolia's coal mines and South Korea's power plants via a strategic railroad, Russia can take a concrete step in pivoting to the Pacific, attracting investment to the Far East, and working to transform the long-term nature of Northeast Asian relations. October 9 (Nanaimo Daily News) Eric Ricker was more than happy to receive a $100 donation from a delegation of politicians from Mongolia who recently visited the historic Morden Mine. Ricker is a co-founder of the Members of the Friends of Morden Mine Society, which has been active for many years in efforts to gather support to make the old mine and the surrounding area a tourist destination. He said the delegation, which consisted of six Mongolian members of parliament and three parliamentary staff members, was "dismayed to learn" that the province has made it clear it has no intention of investing further into the site to save it for its historical values. "I told them that Morden Mine park is the only one of its kind in B.C. that honours mining, even though the premier is currently planning a lot more mines across the province," Ricker said. "I think we made an impression on them and there were some concerns that the mine will be left to rot unless we can find some way to save it." The delegation was on a tour of western Canada to learn about how Canadians have done mining in the past, as well as how they are doing it now. During the visit the delegates met with tax and public finance officials from B.C. and Alberta, provincial and federal legislators, leaders of Canada's First Nations and representatives from industry who work with miningaffected communities. As part of their tour, the delegation specifically asked to see the unique Morden Mine, which began operating in 1913 and ceased in 1921, and is now a provincial park. The mine's tipple is one of only two reinforced concrete tipples that remain in North America, and the mine is one of the last remaining visible structures of any consequence of the old Vancouver Island coal mining industry left in the area. The restoration project envisioned by the society would restore the tipple and construct an adjacent interpretive centre, as well fix the existing trail which winds its way down toward the Nanaimo River. But the society's efforts to gain support and funding from the Ministry of the Environment, which has responsibility over Morden Mine Park, has proven difficult in recent years. "The delegation went on to meet government ministers in Victoria the day after their tour of Morden Mine, so we're hoping that they raised the issue," Ricker said. Please help us improve our services as well as be able to report on our successes! October 9 (ACMS) For several of our funding agencies, the ACMS needs to be able to report on our effectiveness. In addition, we want to get better at what we do by improving our services and expanding our offerings. Getting your feedback is important for these to occur. Whether you are (or were) an active member, fellow, patron, shopper, occasional visitor to our offices or to our website between October 1, 2013 and October 1, 2014, we want to hear from you! Please take a moment to complete our survey. October 7 (infomongolia.com) On October 06, 2014, Chairman of the Social Policy, Education, Culture and Science's Standing Committee, Parliamentarian Dogsom BATTSOGT received representatives from the Asian Development Bank (ADB) led by Country Director Robert Schoellhammer in the Government House. During the meeting Country Director Robert Schoellhammer introduced the "Skills for Employment Project" and "Darkhan Wastewater Management Project", which are proposed projects by the ADB under soft loan terms that worth 25 million USD and the latter project estimates at 18.5 million USD respectively. Moreover, the Country Director Robert Schoellhammer noted that in order to finance these projects, the ADB is seeking approvals and notices from the Cabinet and the State Great Khural (Parliament) to attach above mentioned sums in the ADB budget for fiscal year 2014. In response, the Chairman D.Battsogt said the Standing Committee is ready to support on implementation of these projects in Mongolia and to submit the ADB request to further level of discussion. The proposed project of "Skills for Employment" aims to support ongoing reforms to establish a market-responsive, and competency-based Technical and Vocational Education and Training (TVET) system in Mongolia. The project will deliver employment-focused and quality TVET at all levels to rural and urban learners, including the unemployed and disadvantaged, using traditional and innovative modalities such as structured on-the-job training in teaching institutions, workplaces, and in the community. The "Darkhan Wastewater Management" project will support environmentally sustainable urban development and improved living standards in Darkhan City, Darkhan-Uul Aimag of Mongolia. It will improve the city's wastewater management infrastructure and service delivery through a modern wastewater treatment plant (WWTP), and improved sewer system and pumping stations, and institutional capacity development and policy dialogue. Project records are listed by actual or planned approval date. They contain Project Data Sheets (summary information on projects or programs) as well as project and evaluation documents, business opportunities and other project related information. Information about proposed projects is tentative and indicative (e.g. approval dates). October 10 (news.mn) There is a wedding boom nationwide today as it is believed to be the most special day. This year, the 17th of mid-October (date may change according to lunar calendar) is the luckiest day in Mongolia to be wed. Autumn is widely recognized as the wedding season in the country due to Mongolian religious beliefs of superstitions. Mongolians tend to tie the knot on this specific day more so than others day throughout the year. Today 77 couples are going to marry at the Wedding Palace. It isn't unusual for the Wedding Palace to be the busiest place in the capital on this special day. Since the palace can hardly manage the number of wedding ceremonies in a single day, it opens for a whole 24 hours. In 2013, over 1400 couples tied the knot at the palace. This year the Wedding Palace of Mongolia is expected to register over 1.500 couples` marriage. Ulaanbaatar, October 12 /MONTSAME/ At its regular meeting on Saturday, the cabinet approved a concept of the law on physical education and sport, considering as necessity to alter its some clauses so as to keep a current success of our athletes and develop public sports. Adopted in 2003, the law on physical culture and sport was amended in 2007 for the benefits the disabled and the national teams. Later, in 2009 and 2012, other amendments were made to reflect new clauses--on accreditation, prize fund for national and international tournaments, and in connection with a change of the cabinet. Thanks to all these, Mongolia gave births to Olympic champions, and the society's perception changed about physical culture and sports. By the above concept, the law should reflect clauses on letting NGOs manage specific functions, on developing public sports by improving a quality and adequacy of sports organizations and their kinds, and on updating the social welfare and salaries for sports sector. The cabinet agreed that the current law should be named as "The law on sport" in accordance with a principle of public sports maintained by the International Charter of physical education and sport and the International Olympic Committee (IOC). October 10 (news.mn) The President of Mongolian Sumo Association D.Batbayar announced that Mongolia would host The Sumo World Championships during a press conference today, October 9. Mongolian won the right to host the Sumo World Championships 17:7 in competition against Egypt during the annual International Sumo Federation Conference which was held in Kaohsiung City, Taiwan R.O.C. on August 29th, 2014. The Mongolian Sumo Association schedules the date of the Sumo World Championships at the new sports palace in Ulaanbaatar on July 30 and 31st 2016. For the scope of the preparations for the Sumo World Championships in Mongolia the Mongolian Sumo Association also proposed to hold the Sumo State Championships in advance of the International Sumo Federation. Secretary of Mongolian Sumo Association U.Tuguldur said that the association is working to build a high school based Sumo Institute dedicated to Tsetsee Gun. October 8 (news.mn) For the first time, an official launch of the antidoping.mn web site has been announced during a press conference on Tuesday at the Ministry of Culture, Sports and Tourism. Since this ratification, Mongolia became eligible to apply to the UNESCO Voluntary Fund for grants for anti-doping activities. UNESCO has granted Mongolia 12,600 USD of financial assistance for anti-doping projects for the years of 2014-2015. The website will include information, events and education against doping in sports for Mongolia. October 10 (South China Morning Post) While most of you were gearing up for the start of the new HKRFU Premiership season two weekends ago, Peter Drewett and I seized upon a unique opportunity to visit Ulan Bator for a training session with Mongolia's national team – our fellow members of the Asian Rugby Football Union family. When all eyes in Hong Kong were on the opening weekend's clash between HKCC and Valley, the domestic season in Mongolia had all but finished. However, preparations were already in place for Mongolia's upcoming Snow Rugby competition and the players were also eagerly looking ahead to the 2015 ARFU Asian Five Nations. 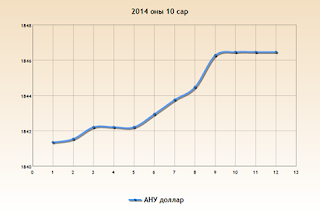 Mongolia are currently in Division IV of the A5N, but are keen to graduate to higher levels of competition. And from what we witnessed on the ground, they could become an up-and-coming force in Asian rugby. Last summer, Mongolia competed in a triangular competition in Brunei against the hosts and Cambodia. They won handily, too, beating Cambodia 49-5 and Brunei 38-13. Mongolia are hoping to build off this performance and climb the next rung on the Asian rugby ladder. So an invite was extended to Hong Kong to help them in this goal by assisting the national team in their preparations. And on behalf of the HKRFU, new national coach development manager Peter and I were pleased to accept. So we packed our woolly hats, gloves and thermals and headed to Ulan Bator for a coaching clinic with the Mongolian National 15. No sooner had our feet touched the frosty ground than we were whisked off to a traditional Mongolian wedding, and we experienced some incredible rugby hospitality. In keeping with the formal occasion, Pete and I agreed to wear our respective national dress, so with my kilt and Pete's Morris Dancing outfit we made our way to join the celebrations! It was a fantastic evening and we soon reached the conclusion that no matter where in the world you find yourself, and no matter how wide the contrast in cultures, you will always find the magnificent fraternal bond that exists in our great game everywhere it is played. Pete and I were strangers to all but one of the wedding guests, but we were wonderfully welcomed as one of the family…even after witnessing my kilted dance moves! The next day with light hearts and heavy heads, it was down to business. On a glorious sunny morning, Peter and I were escorted to the Mongolia Olympic Committee offices where the team trained. The playing field was something to behold and despite our own struggle for pitches in Hong Kong, I must say those Mongolian pitches made ours look like Twickenham by comparison. A mix of dust, stones and shale, marked with the familiar rugby lines, perfectly describes the Mongolian national team's playing surface. Strikingly, there was not one complaint or gripe from any of the players. They strapped their boots on and got on with it with an enthusiasm that is always a delight for coaches. With the help of our translator, who was also the captain and coach of the team, we took the players through various warm-up games, handling skills and unit work. The majority of time was spent in developing the players' game understanding and tactical awareness. The session pushed over three hours and the engagement from the entire team was superb throughout. Mongolia look a highly competent and enthusiastic outfit. The guys were sharp and they adapted well to the tweaks and challenges we posed them during the session. It was a real privilege for Pete and I to be invited to coach the Mongolian 15 and it was a great reminder of how rugby's other half live. We can sometimes forget how fortunate we are in Hong Kong with the wealth of resources we have at our disposal. The guys running around on a dust bowl in Ulan Bator have only a fraction of what we perhaps take for granted, but their enthusiasm and commitment was unwavering. It was an incredible experience for Peter and I. Huge thanks go to the Mongolian RFU for hosting us and of course to the HKRFU for supporting this worthy initiative. The HKRFU has always played an instrumental role in developing Asian rugby – the perfect example, of course, being the Hong Kong Sevens which was founded in part with the inspiration of providing opportunities for Asian nations to play world-class opponents. Despite a rugby tradition in the region that dates back for more than a century and the world's largest population by region, Asia has only six per cent of the global player-base. As such, the region remains one of the world's greatest markets to grow the game. Now that international sevens has caught up with Hong Kong, and with the development of the international series and sevens' new Olympic status, there has been a narrowing of some competitive opportunities for teams like Mongolia. As such, it will be even more important for the HKRFU to continue to expand its support role in the region alongside ARFU and the International Rugby Board. I would also like to pass along our very special thanks to the HKRFU club coaching officers and the Hong Kong Society of Rugby Football Union Referees, who kindly donated a bag full of kit for the Mongolian players. Peter and I left Ulan Bator hoping to work with our Mongolian rugby allies again … but having seen their commitment and enthusiasm for the game, we will also be keeping a close eye on their progress in next year's A5N. Ulaanbaatar, October 8 (MONTSAME) Our Ministry of Environment and Green Development together with scholars and some NGOs presented results of an "AICHI 2020 in MONGOLIA" also known as Aichi goals at the 12th meeting of the Conference of the Parties to the Convention on Biological Diversity. The meeting has been running October 6-16 in Pyeongchang county of S.Korea. The Ambassador Extraordinary and Plenipotentiary of Mongolia to the Republic of Korea B.Ganbold has attended the event to say that it is a fundamental duty of humanity to protect the environment--the base of their health and well-being. Mongolia has been successfully realizing many works for studies and conservation of biodiversity, and has a capacity to collaborate with others in this field and to reach sustainable green development through reestablishment and efficient consumption of resources, he said. This event is of great importance as it becomes a platform to present statuses of implementation of the Convention and planned frameworks, and to claim the need of further cooperation with donor countries and international financial organizations for environment. Ulaanbaatar, October 7 (MONTSAME) A thirteen year-old N.Aisholpan, a girl from Altantsugts soum of Bayan-Ulgii aimag, has won the Cup in a category of "Eagle-hunter with the best eagle and horse accessories" at the "Khyran 2014 Eagle Festival", which took place October 4-5 in Sayat Tolgoi of this province. The festival was held for the 15th time. It has become a regular Tourism event, co-organized by the office of the governor of Bayan-Ulgii, the Department of Culture, Sports and Tourism and Mongolian Eagle hunters Association. The festival consisted of various kinds of tournaments, such as "Best eagle and horse accessories", "Stuffed animal catching", "Kokbar–leather bag winning", "Khyz Khuar–Girl chasing", "Coin catching", "Uriankhai archery", and "Best dressed couple in Kazakh national costumes". It was the first time that women eagle-hunters have participated in the tournaments. October 7 (infomongolia.com) An American actress and screenwriter, Mayte Michelle Rodriguez, who has been acting as Leticia "Letty" Ortiz in the "The Fast and the Furious" series since 2001, moreover her most successful film starred to date which is "Avatar", has journeyed to Mongolia on October 01-05, 2014. Before arriving, the Hollywood actress stayed in South Korea to see the 2014 Asian Games held in Incheon and in Mongolia, Michelle Rodriguez spent her first couple days in Ulaanbaatar, after which she headed for Bayan-Ulgii Aimag to experience the Eagle Festival took place near Bugat Sum of the Aimag on October 04-05, 2014. During the travel, she was familiarized with nomadic life and culture of Mongolia, particularly, she was amazed to witness the eagle hunting contest held during the Festival, which has been organized in Bayan-Ulgii Aimag for the consecutive 15th year. And in her Facebook page Michelle Rodriguez noted, "That little eagle hunting girl Ashol Pan (N.Aisholpan) beat 40 of the best eagle hunters in the province at the golden eagle competition. She took 1st place, she's only thirteen and she comes from a Kazakh Muslim eagle hunting family her dad taught her. Her and her family travelled on horseback about 40 kilometers to get to the competition. They live a nomadic lifestyle and I'm sure hunted traditional style on the way to the event. I can't wait for this next generation to take over. Mongolia is beautiful by the way rich in culture… Not too fond of the city life there but the Step what they call the mountain wilderness is beautiful. The horses are a bit stubborn but they are amazing on the toughest terrain and they are great mountain climbers…". Moreover, Michelle Rodriguez was briefly interviewed during the Festival and said she was cures about the culture and couple years ago she did a DNA test at National Geographic and they told her that her ancestors are come from Mongolia from her mother's line, and she liked the way of nomadic life in Mongolia. The Eagle Festival or Golden Eagle Festival is an annual traditional celebration held in Bayan-Ulgii Aimag of Mongolia, where the Kazakh eagle hunters (Burkitshi) celebrate their heritage and compete to catch small animals such as foxes and hares with specially trained golden eagles. Winners are selected for speed, agility and accuracy, as well as other contests including the best traditional Kazakh dress and Kazakh traditional games known as Kekbar (tug of war on horseback), Kyz Kuar (woman chase), Tenge Ilu (horse game where a rider at full gallop must swoop down to pick up coins from the ground) and Camel race are being organized. CEDAR CREST, NM, October 8 (KRQE) - Federal agents raided a New Mexico-based gallery company last week looking for evidence in a dinosaur fossil smuggling case. The investigation centers around Touchstone Gallery. The company, which sells jewelry, fossils and minerals, has four locations in New Mexico and Arizona. Agents searched the company's Cedar Crest headquarters, its Taos location and owner Joe Wilhelm's Sandia Park home. A federal search warrant application filed in late September and obtained on Wednesday by KRQE News 13 explains why. In July 2013, Homeland Security Investigations agents were first given a tip that Touchstone was selling Oviraptor eggs at its Sedona location. Months later, agents say they entered the Santa Fe location and spotted a pair of Oviraptor egg clusters for sale, advertised as coming from Mongolia. That caught investigators' attention. HSI has been returning fossils to Mongolia for the last few years because of that country's artifact laws. "Mongolia has what we call a patrimony law," said HSI special agent Daniel Brazier, while discussing a separate case in July. "It dates back to 1924 and what that is is a law that protects in this case the fossils and the cultural property of Mongolia. It can't be taken out of the country without certain permissions from the government." Federal agents bought a single egg cluster and a double egg cluster from Touchstone for $5,100 in January and met up with Wilhelm to pick up the fossils. Agents came away with the impression that Wilhelm had a different understanding of Mongolian law. "Wilhelm told your Affiant that he had purchased the Oviraptor eggs in 2009 and in 2010 the Mongolian government placed export restrictions," wrote HSI special agent John Koski in that search warrant application. "Wilhelm stated that the Oviraptor eggs had been imported into the United States in 2008 by a brother/sister team." That set the stage for this month's raid. According to the search warrant, agents recovered another artifact, a Keichousaurus fossil, from the Taos location. That fossil may have originated from China. News 13 spoke with Wilhelm over the phone late Wednesday night. He said he had not read the search warrant application and so couldn't comment on specifics mentioned in it. "I believe what we've done is legal," Wilhelm said. "We're doing everything we can to cooperate with [federal investigators]." Wilhelm also said he was led to believe agents were waiting on analysis of the fossils. This kind of case has gotten some people prison time in recent years. Commercial paleontologist Eric Prokopi pleaded guilty in Dec. 2012 to digging up fossils in Mongolia and smuggling them into the United States. He got three months in prison. MATSUURA, Nagasaki Prefecture, October 3 (The Asahi Shimbun) --A wreck found off Takashima island here is likely part of a Mongol invasion fleet that came to grief in a typhoon more than 700 years ago. The discovery was announced Oct. 2 by archeologists with the University of the Ryukyus and the Matsuura city board of education who are researching the Takashima Kozaki underwater historic site. Numerous artifacts have been recovered from the seabed from wrecks of fleets dispatched in 1274 and 1281 to invade Japan. In both invasion attempts, battles were fought in northern Kyushu. The fleet of 4,400 vessels sent by Kublai Khan in 1281 was wrecked near Takashima island in a storm the Japanese dubbed "kamikaze" (divine wind) for ultimately saving their homeland from the Mongols. The latest wreck, discovered using shipboard sonar, lies 14 meters below the surface about 1.7 kilometers east of another Mongolian warship that was discovered in 2011. Nine sites of interest were detected and divers found timbers in some of the spots. The wreck mainly comprises the port and starboard structures near the bow of the ship. Planks on the starboard side are at least 11 meters long. Divers also found stone ballast, prompting researchers to speculate that the ship's keel lies underneath. The wreck is in a better state of preservation than the one found in 2011. But experts are unable to conclusively determine its origin as no artifacts like Chinese porcelain have been recovered. "We really hope it is a Mongol invasion ship," said Yoshifumi Ikeda, a professor of archaeology at the university who is leading the research effort. "We plan to clarify details like its structure, size and origin by excavating further. It's well preserved, so we expect it to carry a significant load of cargo like porcelains and weapons." The team plans to excavate the shipwreck in fiscal 2015. October 6 (The Nature Conservancy) It was the end of a long day and we (myself and two rangers) were almost finished surveying marmots at Toson Hulstai Nature Reserve in Mongolia's Eastern Steppe. We made one last stop to count a herd of Mongolian gazelles. I was surveying them through binoculars and counted all the way to 3000 when a small, stealthy movement caught my eye. I looked more closely and could not quite believe what was I seeing. Chono – the gray wolf – moving across the grassland. I held my breath as he turned his head toward me and stood silent and suddenly still. Did he sense my presence, my eyes on him, even across the distance between us? He was alone, trailing the unsuspecting gazelles, and a moment later he was gone, vanished into the gathering dusk. As a biologist, seeing a gray wolf — a species that has become virtually extinct in the Eastern Steppe — was exciting because it is living proof that the Conservancy's work at Toson Hulstai is successfully supporting important predators, a sign of a healthy landscape. The scientist in me was pleased and gratified to get photographic documentation of wolves returning, but the Mongolian in me was not nearly so calm. I was awestruck and breathless, barely able to believe what I had seen, the gift the grasslands had given me. For my people, the gray wolf is an important symbol of our culture, an ancestor to Chinggis Khan. Yet, in day-to-day life, the wolf is also a potential predator on the animals Mongolian nomads raise for their livelihoods. In this, the wolf carries double significance: a respected, mythical being of immense cultural value, but also a potential direct contributor to hard times. Because of the risk wolves pose to livelihoods, hunting of the wolf has been rampant, and led to their precipitous decline in the Mongolian grasslands, as in many other parts of the world. But the wolf plays an important role as the only top predator in the Eastern Steppe. Without Chono, the ecosystem teeters out of balance—populations of gazelles, marmots, hares and other prey grow too rapidly and overgraze the landscape. In Toson Hulstai, people are part of the balance here as well, and we work with herders to implement practices that will ensure that just as the wolf and the gazelle have enough to eat, so too do the livestock on which herders depend. And, our work throughout the Eastern Steppe is helping to protect the large landscapes that wolves, gazelles and other grassland species need to roam and forage. Hunting of wolves is still a problem, but the tide may be turning. I've spoken with many herders who have also recently seen wolves in Toson Hulstai. They tell me that when wolves abounded, they didn't know how important this creature was. But when the wolves were gone, they missed their howls filling the emptiness of the grassland nights. There is a Mongolian saying that no one can see a wolf unless he or she is that wolf's equal, and as I think about this day, I consider myself lucky and perhaps even an emissary of the people of the Steppe. We are working so hard to prove ourselves equal to Chono, showing that we can bring balance to the ecosystem, creating and managing a landscape where wolves, gazelle and livestock can thrive, and human herders and hunters of all species can coexist. It's hard to describe the way I feel here in the grasslands. This is home for me, as it is for Chono. And standing in the space between land and sky with the mountains a distant backdrop, feeling the breeze rush over my skin and tug at my clothes, listening to the grasses murmur in the wind and knowing that we may soon hear wolves once again howling the moon down over the Steppe, I am grateful and I am at peace. October 3 (The Siberian Times) It is a little known tradition that dates back to mountain civilisations of around 1,000BC. For at least three thousand years, the remarkable 'bird men' of Mongolia have managed to tame wild golden eagles and train them to become their own personal hunter gatherers. Raising the birds from an early age they treat each as if it were their own child, helping them learn how to fly and kill prey, and adapt to a life alongside humans. And with the beautiful beasts perched on their arms, like a treasured family pet, they can command their birds to seek out food, including hares, foxes and even wolves. But the art is dying out across the region, with as few as 250 people now living and working with their own eagles. Now communities living in neighbouring Siberia hope to resurrect the tradition in the eastern part of Russia and make hunting with birds part of day-to-day life once more. The plan has been met with opposition from conservationists already fearful at the dwindling population of golden eagles. 'It is extremely important for people that live close to the footsteps of the mountains to bring back the traditions of their ancestors', said Auelkhan Dzhatkambayev, the head of the Kosh-Agachsky district. 'We want to learn from the Mongolian eagle hunters'. But Alexey Ebel, a Siberian ornithologist and photographer, said he was concerned by any move to bring back the prehistoric form of hunting. He said: 'I would like to point out that in Mongolia all the birds are taken from their nests. I don't have statistics on how long they live in captivity but many of the birds have light-coloured tails, which means they are young. 'As for the Kosh-Agachsky district, there was a decrease in the golden eagle population over the last 10 years with several nests disappearing'. Communities in Mongolia have been taming eagles to hunt for at least 3,000 years, with petroglyphs found in Altai Mountains in Siberia giving signs of it from prehistoric times. There is also evidence that it was a favoured 'noble' pastime of the fearsome Turkic warriors in the early Middle Ages. It is still practised in parts of Mongolia and Kazakhstan, with an estimated 2,000 birds used by the eagle hunters across the region. Indeed, young men do not begin their education until they have turned 13 and are said to be strong enough to carry a fully grown eagle on their arm. The birds are not bred in captivity and are instead taken from their nests at a young age before they have learned how to fly. Hunters, known as berkutchy, then raise them as if they were their own children, feeding them and teaching them how to adapt to living with humans before spending years training them in the art of hunting. The eagles, which weigh up to 6kg and can have a wingspan of more than 7ft, are then used to kill foxes and hare during cold winter months, when it is easier to see the gold-coloured animals against the snow. Such is the renewed interest in the tradition in Siberia that the first ever eagle hunting festival was recently held in the region, attended by 22 of the most experienced Mongolian handlers. The event was held in the shadow of the Altai Mountains, with berkutchy – dressed in full eagle hunting regalia and mounted on decorated horses - competing for a number of prizes. Mongolian berkutchy Alimbay Skakh said: 'A golden eagle lives for about 50 years and from the very first moment it is picked up from a nest it is a member of the family that knows only one master. Our first task is to get it used to humans, and only after that the hunting training begins. Several years after that the eagle can hunt foxes, hares and even wolves'. In a welcome message to the hunters attending the recent festival, which was organised by Mr Dzhatkambayev, the region's government stated: 'The area of Altai is ideal for eagle hunting, a tradition for the people of the steppe for the last 3,000 years'. Next year another festival for eagle hunting is being held in Mongolia, where it is hoped the first Altai Siberians representing Russia will take part. 'We've got miles to go to catch up with Mongolian hunters', one of the participants said. 'Still the main thing is that we have decided to bring this tradition back and we are determined to learn'. But Alexey Ebel described the festival as nothing more than a 'public slaughter of domestic and wild animals'. He added: 'That, together with the criminal punishment in Russia for taking rare birds out of their nests, makes me wonder what chances the whole idea of doing a hunting show stand – and if it should be happening'. There are estimated to be about 10,000 breeding pairs of golden eagles in Europe, but the numbers in Russia are more difficult to calculate. The International Union for Conservation of Nature believes there may be anywhere between 100 and 10,000 in the country. October 6 (Voice of America) Life is filled with adventures and not always close to home. One way to get really acquainted and learn firsthand with those living far away is by couch surfing. Couch surfers rely on an international non-profit network connecting travelers with local residents willing to open their homes and make cross-cultural connections. Couch surfing has 9 million participants around the world, with the largest number from the United States. Germany, France, Australia and China are also among the top 10. And it's free. In a documentary called A Mongolian Couch, a man named Begszuren hosts foreign visitors and shows them what life is like in the hills surrounding the capital city of Ulan Bator. Begszuren lives in one of the city's "ger" districts, an overcrowded area with little or no electricity, running water or waste disposal. He lives in a one room, 36-square meter house with his wife and four children. Travelers get to stay with them and experience many of Mongolia's traditions and daily living conditions, unsophisticated by western standards. In return, guests offer Begszuren help and know-how with such things as improved irrigation, hot water, and cooking. While Begszuren does not have the material possessions enjoyed by his foreign visitors, the documentary shows a quality of life that is often lost in today's modern world. Living in such close quarters is less expensive, promotes close family relationships, and a heartfelt willingness to share with others. A Mongolian Couch is directed by George Clipp. VOA's Ray Kouguell spoke with Clipp, born in London and now based in Melbourne, Australia, about the couch surfing experience and how he came up with the idea to make a film about it. CLIPP: I was actually in Mongolia. I was there doing an internship with one of the state television stations in Ulan Bator. And I wanted to do a project outside of the internship. I thought why not couch surfing because I had used it before while I was traveling and I was just trying to find interesting people with interesting stories. I came across Begszuren's profile and I was just amazed by the number of people he had hosted and the cool things he was doing so I got in touch with him, arranged to meet with him and went from there. KOUGUELL: Were you able to offer the family any practical advice and did you receive any from them as part of the experience? CLIPP: They taught me a lot about Mongolian culture. The family told me about Mongolian music and Mongolian food and the countryside. I think I taught the kids a little bit about film making and definitely some kind of cultural exchange going on between us. He taught me how to ride a bike around a busy city and we were learning stuff off each other all the time, really. KOUGUELL: Did Begszuren and his family help any other families nearby with couch-surfing? CLIPP: I think other families were very, maybe skeptical at first of the idea or weren't entirely sure of what Begszuren was doing and I know, like, he was couch surfing so it changed his diet which makes a lot of changes in his family's lifestyle. So I think the neighbors sort of watched keenly but as far as I know, none of them have hosted. But when we were there we met a few of the neighbors and they were friendly. And where he lived, not so many people spoke English, so I guess it's more of a barrier with the other families. But I'm sure since then there's been a knock on impact on the neighborhood with the projects and stuff he's been doing through couch-surfing. KOUGUELL: How prevalent is couch surfing in Mongolia and elsewhere in Asia? CLIPP: When I was there I think there are maybe six or seven couch surfers listed for the whole of Mongolia, [and] I know that's increased since. When I was there, there really was very few, it's quite a small community. But I think with couch surfing, word spread fairly fast and there's a lot more now in Mongolia. As for the rest of Asia, I know in certain places there's a lot, in other places, not so much. But I think couch surfing now has a pretty good coverage all over the world. KOUGUELL: Would you say there's some kind of message about inviting foreign visitors to live in your home? CLIPP: There's a strong message of just how much there is to gain for everyone. I mean there's so much more than a place to sleep. Such an exchange of ideas and cultures, it's so beneficial both for the people staying to get ideas of what to see and what to do from locals, rather than from tour books or tour guides. And then for the people hosting, to see so much of the world without leaving their own house, I think is amazing. You have people who can't travel or committed to work or committed to a certain city or place. They can host people from all over the world and just learn so much about countries that they may get to visit in the future, [even if] they may not, but they still [experience] so many ideas being shared. KOUGUELL: Begszuren says that couch surfing may change the world. Do you agree with that? CLIPP: Yeah I think definitely. I think there's been so many connections forged between people from all over the world. I think it's already, maybe in a small way, it's already changed the world. For some people, definitely, I think there's lots of friendships and people have met on couch surfing and stayed in touch for years and years and they've sort of gone to each other's places. Yeah, I think it shows a great side of humanity which some people may not think exists anymore. People would let complete strangers in and put them up and that element of trust I think is fantastic and the more positive experiences couch surfing generates, the more trust there will be between people. So I think it can definitely change the world. KOUGUELL: Clipp is certainly making his contribution. At just 11 minutes long, A Mongolian Couch is the winner of several independent film awards and screened around the world in the United States, Europe and Asia. The film shows that reaching out to others is a mutually rewarding experience and as Clipp's work proves, couch surfing is the essence of sharing, no matter the distance. October 8 (St. Louis Review) In 1992, Father Wenceslao (Wens) Padilla and two other missionary priests from the Congregation of the Immaculate Heart of Mary arrived in Mongolia to find people searching for God and for holiness. It was just after decades of Communist rule in which religious freedom wasn't allowed, and the people of Mongolia hadn't heard the Good News of Jesus proclaimed to them during that time. But the new democratic government said it would welcome the presence and work of the missionaries. Father Padilla, a native of the Philippines, and his fellow priests found a country struggling with issues such as alcoholism and domestic abuse, with minimal government social services and extreme poverty. The priests started from zero, with the first baptisms taking place three years later. Today, Father Padilla is the bishop of the territory with about 850 Catholics and four parishes. He continues to reach out with practical and spiritual support for those in need as he builds the Church in Mongolia. Twenty to 50 new Catholics are welcomed into the Church each year. One of those is Gantulga, baptized on Easter of 2013. He lives in a rural town with his wife and five children. Gantulga had battled with alcoholism and violent behavior until witnessing the peaceful effect on his wife when she attended Mass and church activities with the children. He started learning about the Church and attending Masses and made drastic changes in his life, becoming a leader in his community and reaching out to others in need. The development of the Church in Mongolia is supported by the Society for the Propagation of the Faith, which has been involved since Bishop Padilla first came to the country. Contributions in parishes on World Mission Sunday, Oct. 19, make the outreach possible. It funds new churches and schools, trains catechists, runs medical centers, enables transportation for missionaries and operates homes for children with disabilities and children who are homeless, among other efforts. Msgr. Francis X. Blood, director of the Society for the Propagation of the Faith for the archdiocese, cites the Church in Mongolia as one example of people building the Church throughout Asia, Africa, the Pacific Islands and parts of Latin America and Europe, giving help and hope to the poor. World Mission Sunday helps support 1,150 mission territories. It is "making a difference where they don't have infrastructure and need the help of the worldwide Church," Msgr. Blood said. He noted that the Old Cathedral in St. Louis was built with similar help. In a letter to Catholics of the archdiocese, Archbishop Robert J. Carlson noted that "Pope Francis encourages us to take joyful part in the Church's mission to all the nations, as we live our lives grounded in love for Jesus and concern for the needs of the most disadvantaged. May World Mission Sunday offer each one of us an opportunity to accomplish both, as we share the joy of the Gospel and help the poor by our fervent prayer and through generous hearts." The archdiocese has a mission in Bolivia and also has a program in which a missionary speaks at Masses at a parish to raise money for a mission established by a religious community or diocese. "It helps educate Catholics here about something going on in one area of the missions, but what we do on Mission Sunday is for the whole world," Msgr. Blood said. "It's the one day when every Catholic in the world is called to pray and sacrifice for the whole world, not just one particular mission." October 9 (Straits Times) A Singaporean man undergoing a bitter divorce in London has found himself stuck in the British capital, unable to return home, even as his son was forcibly taken from his parents' home in Singapore two months ago. His Mongolian wife had entered Singapore illegally, defied a Singapore Family Court order and tried to smuggle their two-year-old son overseas, which saw her jailed for 10 weeks last month. Both parents cannot be named under the law, to protect their son's identity. The ongoing divorce proceedings and furious custody battle caused Ben (not his real name) to lose his bank executive job. It also led to him being jailed and ordered by a British court to stay out of his own apartment in London. Ben, 36, is unable to return home to Singapore as his passport was impounded after his wife alleged that he had raped her during their marriage. Speaking to The Straits Times from London, he said he fears for his son's safety, as he believes his wife and her accomplices would "keep trying to take his son away until they succeed". On Tuesday, his wife, who was living in London on a spouse dependent pass, was released on remission and deported to her home country, Mongolia. The 30-year-old had admitted to entering Singapore illegally on Aug 19, and hiring a catamaran in Malaysia to try and get the boy out of the Republic. Her accomplices - Adam Christopher Whittington, 38, British managing director of Child Abduction Recovery International, and Australian Todd Allan Wilson, 39, who owns the vessel - were jailed 16 weeks and 10 weeks respectively. The court had heard how Ben's wife and Whittington went to his parents' apartment and took their child by force, leaving the elderly parents hurt after they put up a struggle. Ben's wife eventually took the boy away. Giving his side of the story for the first time, Ben said: "It was past 1am when I received a phone call from my mother, who was hysterical. She told me that she and my father were assaulted by an unknown Caucasian man at the lift landing just outside their apartment... I was very distressed as I was stuck in London, unable to come home to my family's aid in their hour of need." Following his wife's arrest, Ben applied to the British High Court to release his passport so he could return to care for his family, but was told there was a shortage of judges, so his application could not be heard. When he returned last month, a judge told him he had not read the documents, and that the court also wanted to wait until his wife was released from prison. Ben said his son, who is still in his parents' care, had recurring nightmares for weeks after the incident, but is generally doing well. He said: "She (his wife) had wanted to subject him to a long boat trip from Singapore to Langkawi, without any proper clothing or food. What kind of mother would do such a thing?" Ben said he met his wife in a bar at Singapore's Hyatt Hotel in December 2010 and they married here in June 2011. They moved to London in October 2011, and their son was born in July the next year. According to Ben, their marriage fell apart early last year because his wife was frequently violent towards him. In July last year, the couple took their son back to Singapore, to Ben's parents. They returned to London by themselves a month later. In January this year, Ben filed for divorce in Singapore. His wife then started her divorce proceedings in London. Ben has since taken out an order from a Singapore court to restrain her from taking their child out of the country. Meanwhile, she has obtained an order from the British court for the return of their son. However, Ben said that he is unable to travel to effect the return of the child, as a result of the passport order. His parents have refused to return the child to Britain and have also taken out court proceedings to have custody of their grandson.